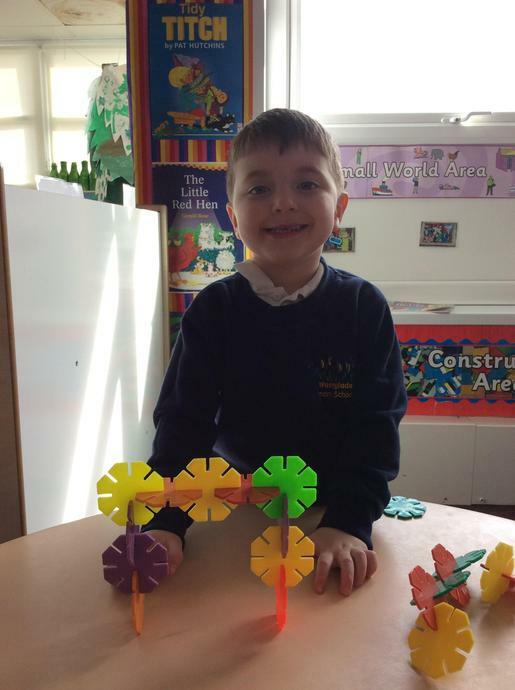 Spring 2 - What happens next? 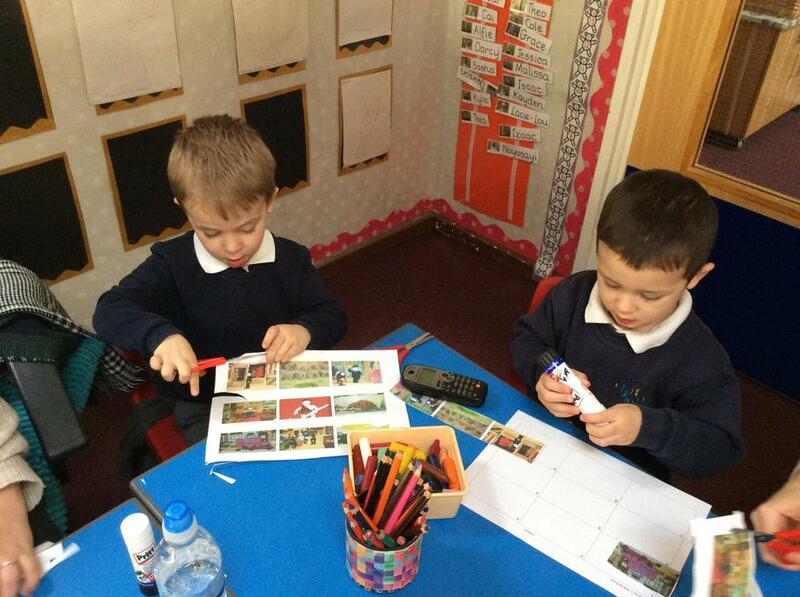 We have lots of exciting activities to go alongside our daily tasks. 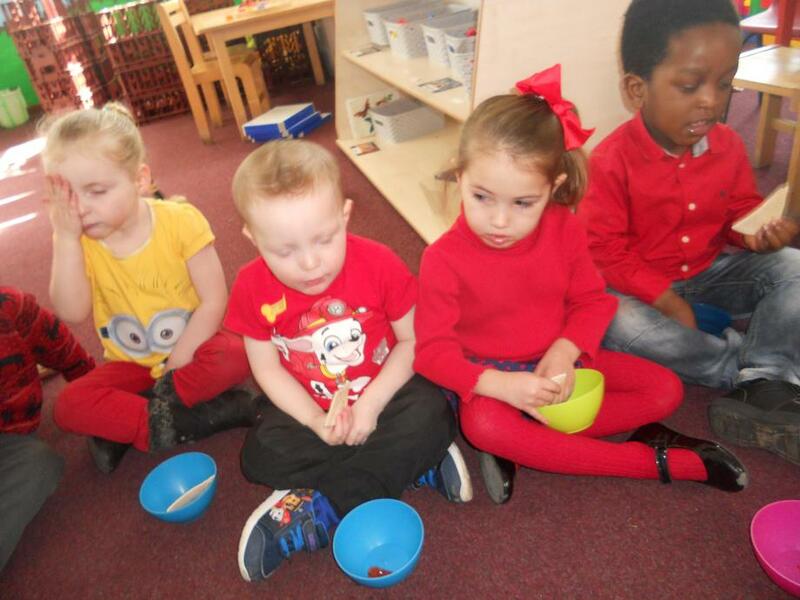 On Thursday morning we enjoyed an Easter egg hunt on the field and then sat together to eat the eggs. 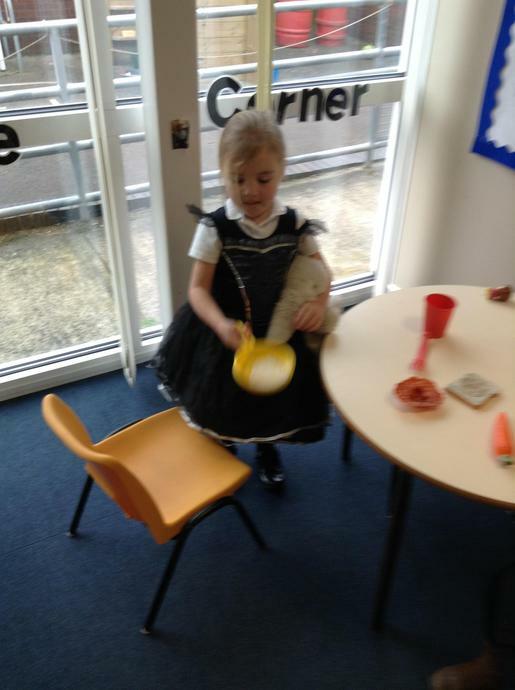 On Thursday afternoon our parents came and we had an Easter Parade showing everyone our hats and bonnets. 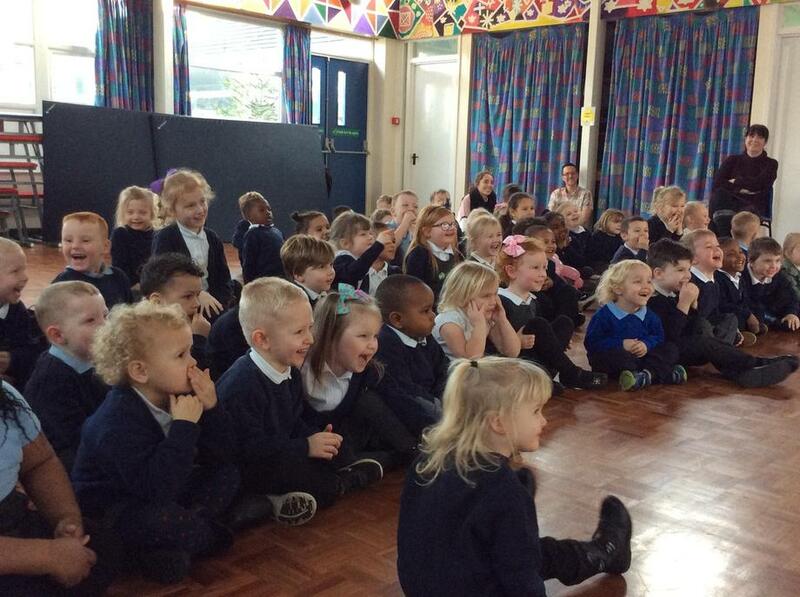 we also sang some of our favourite songs. 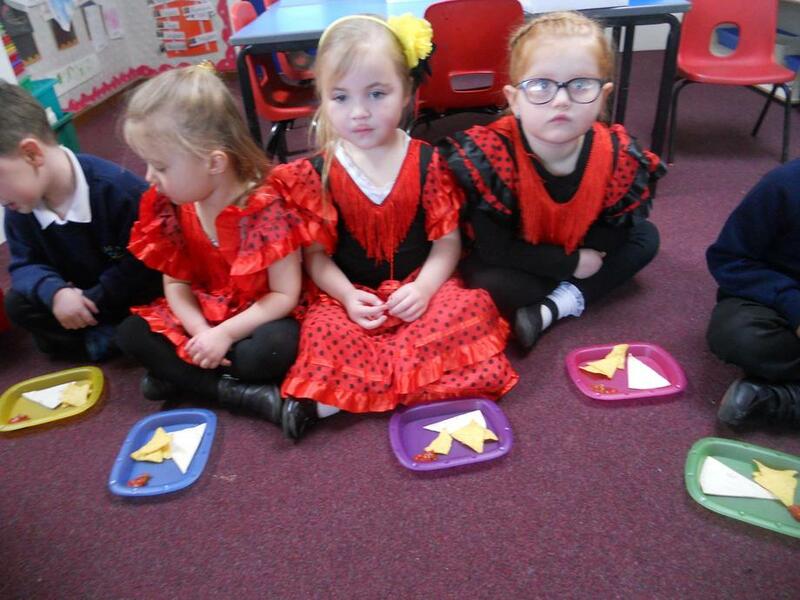 Spanish Day at Westglade was fun and exciting. 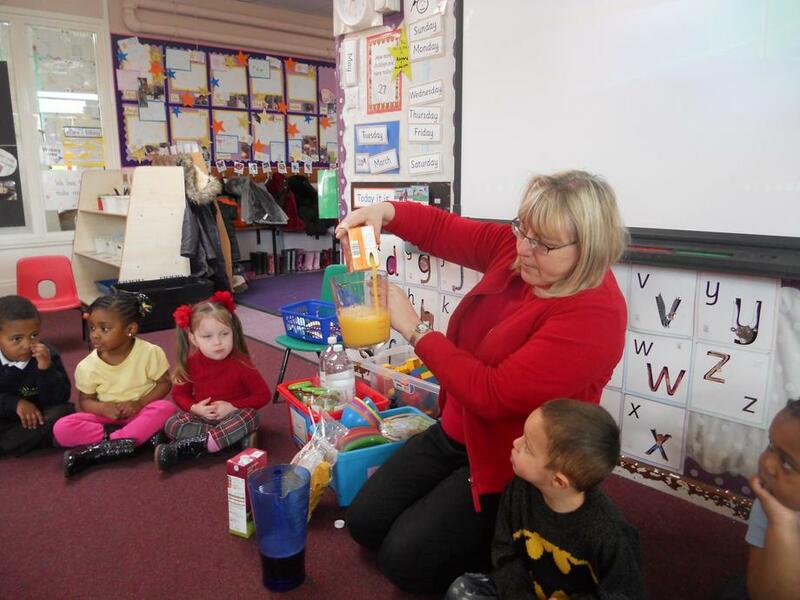 We had Sangria made with grape juice, orange juice and lemonade. 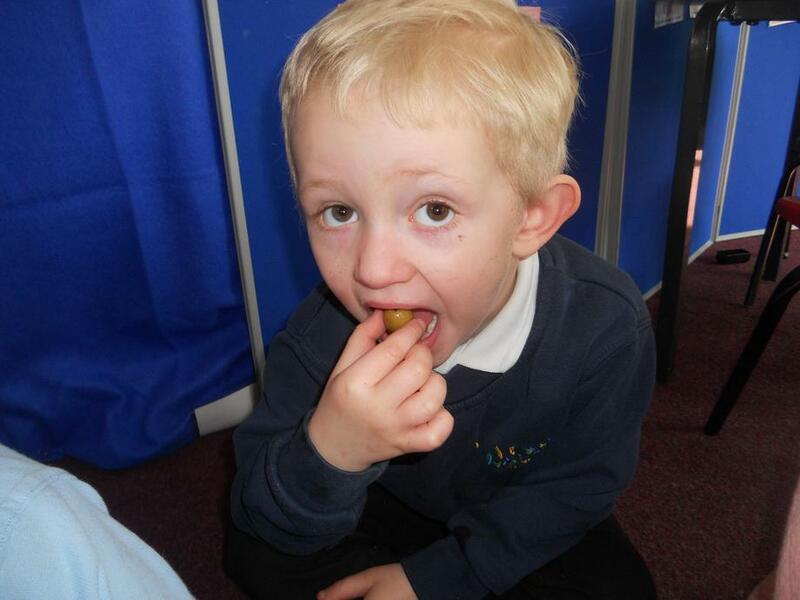 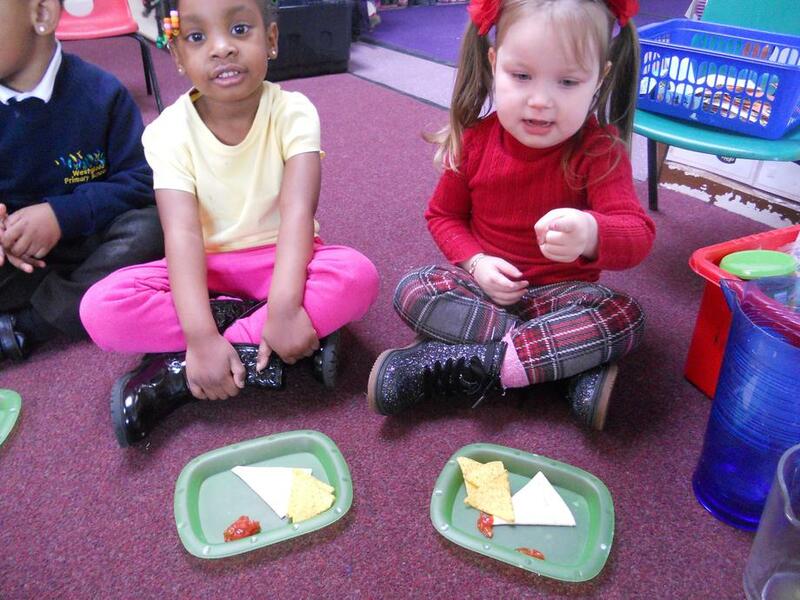 We tasted tortilla wraps and crisps, salsa and olives. 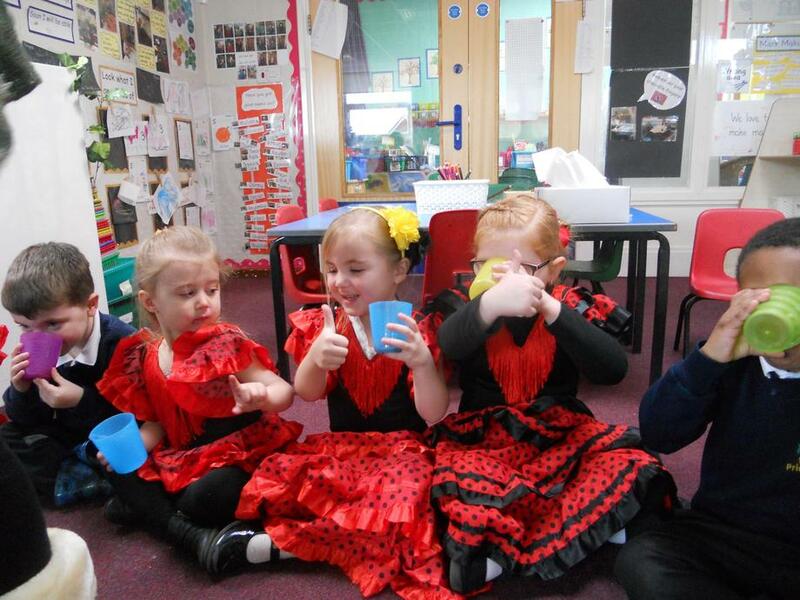 We made castanets to play with Spanish music. 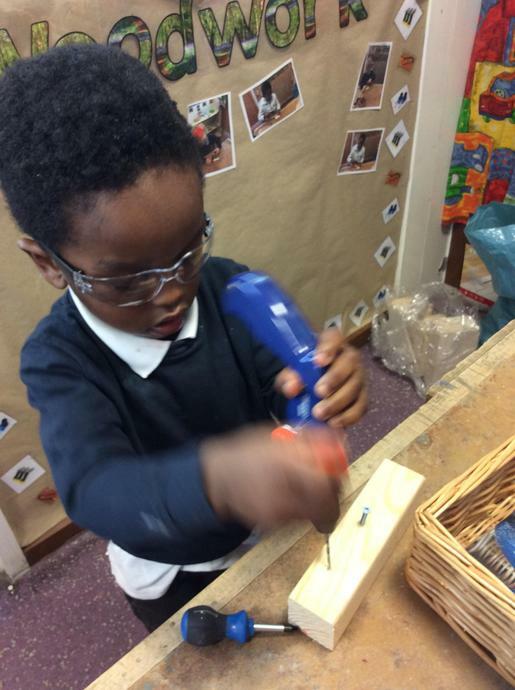 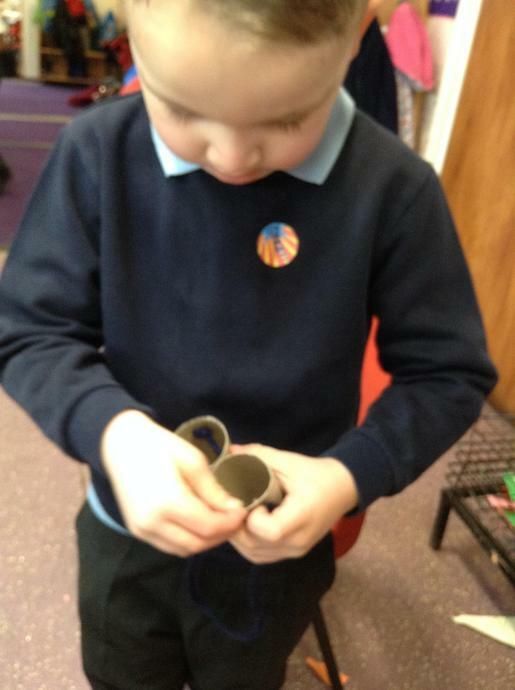 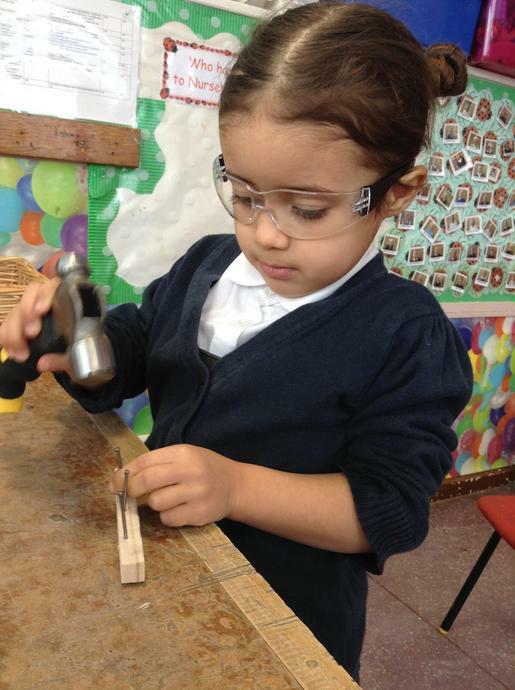 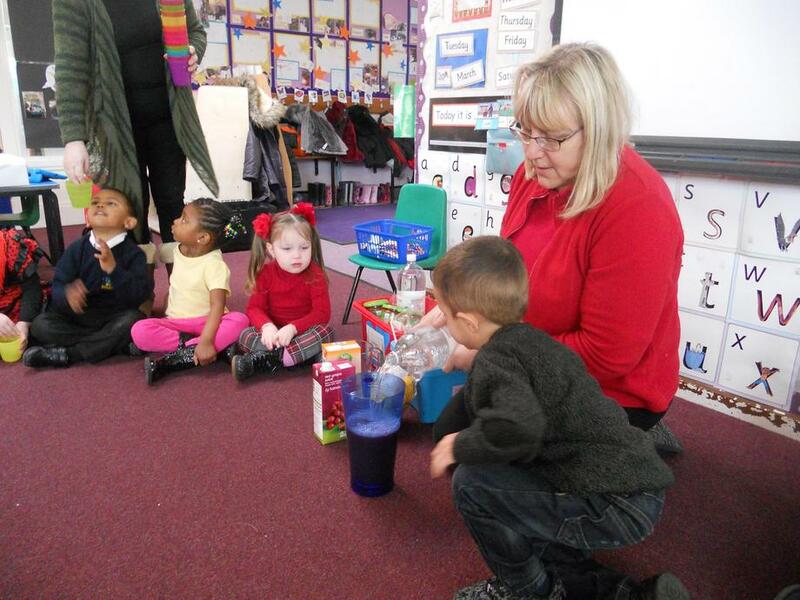 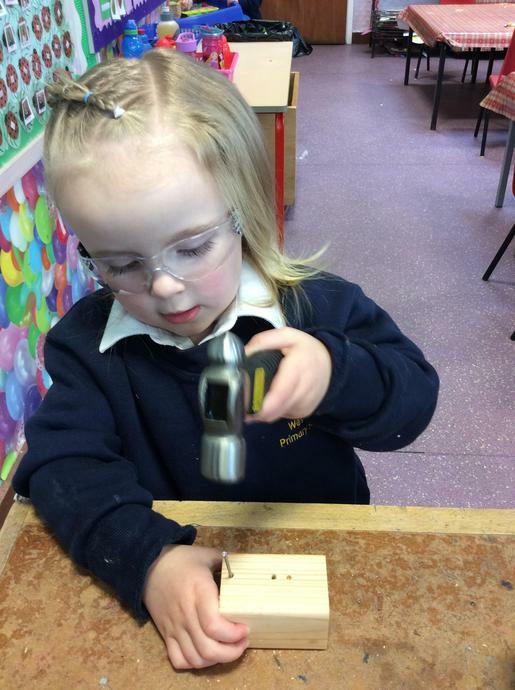 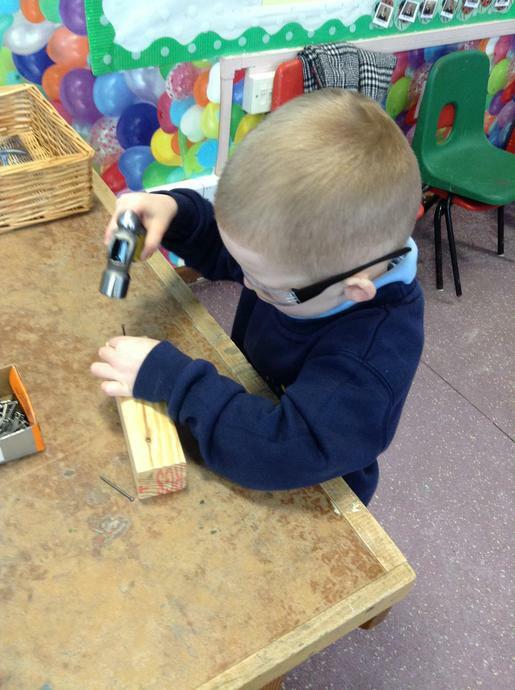 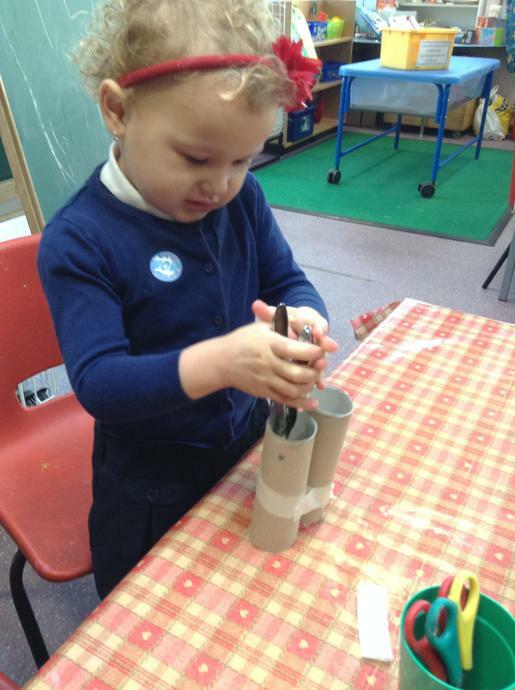 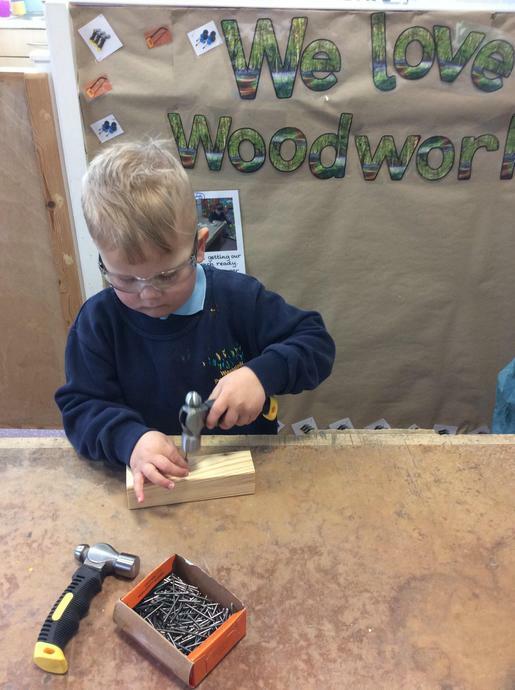 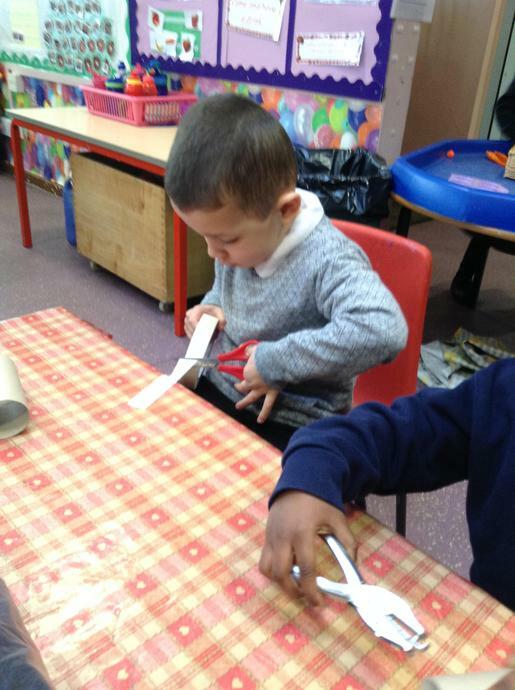 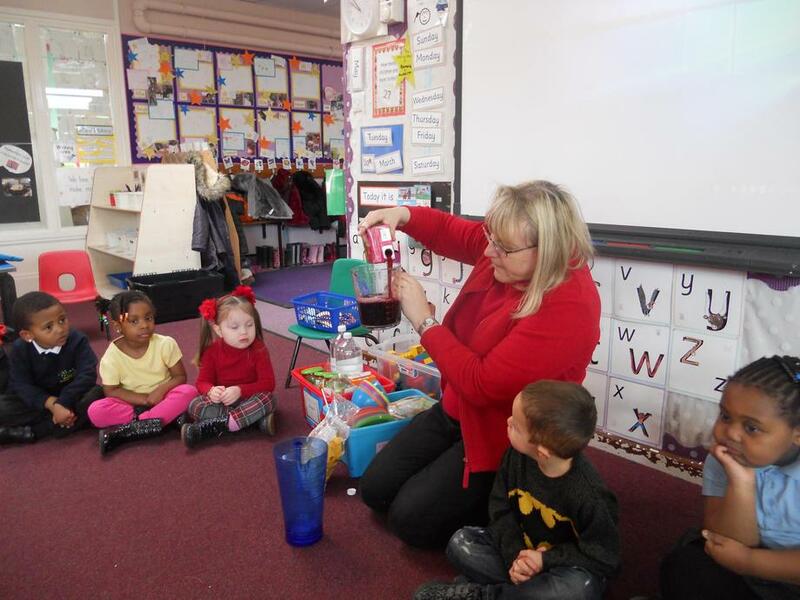 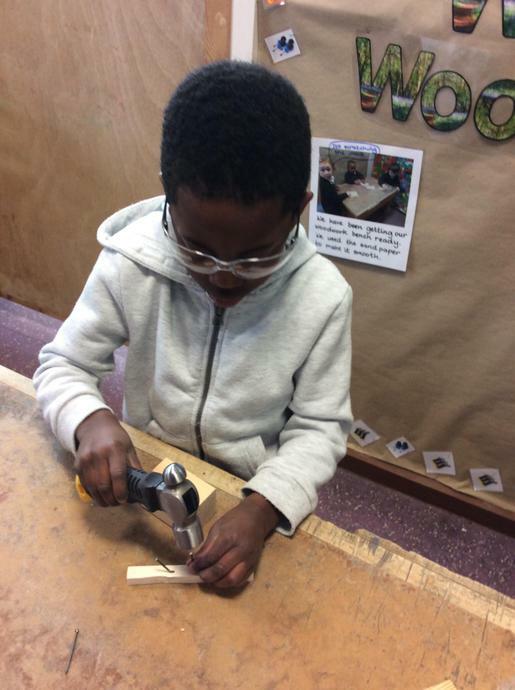 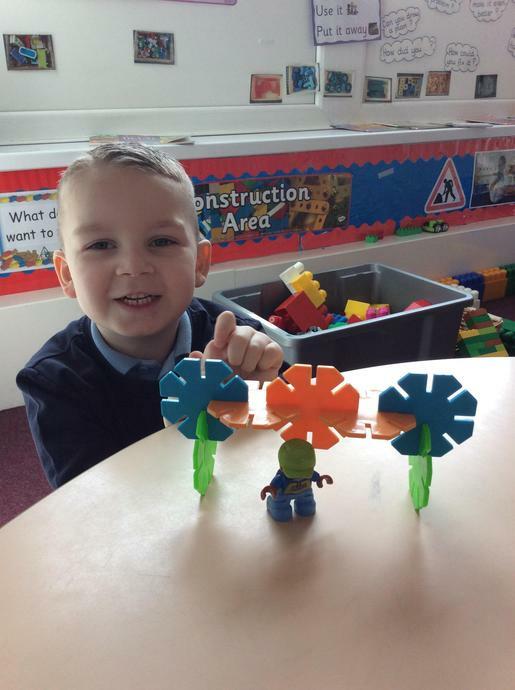 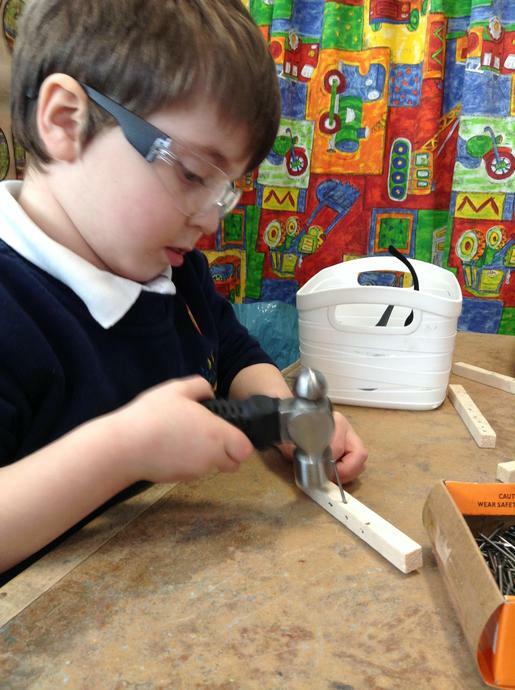 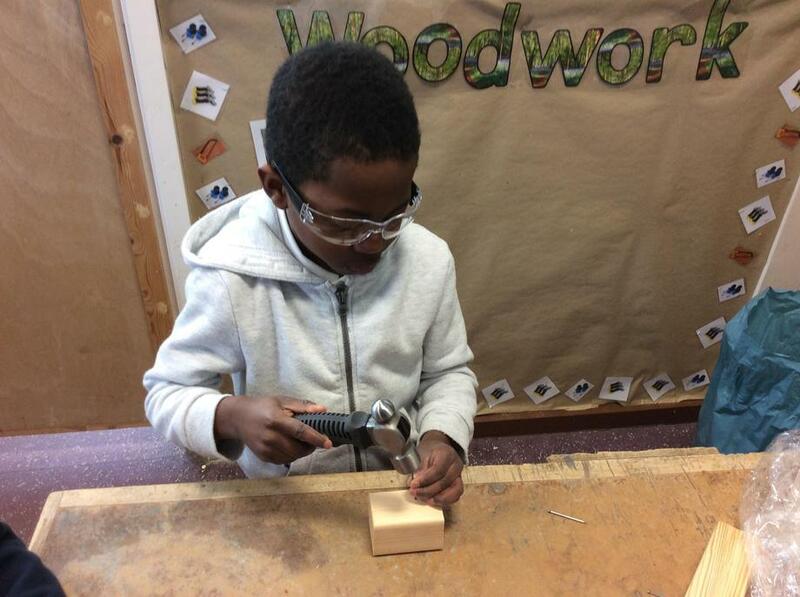 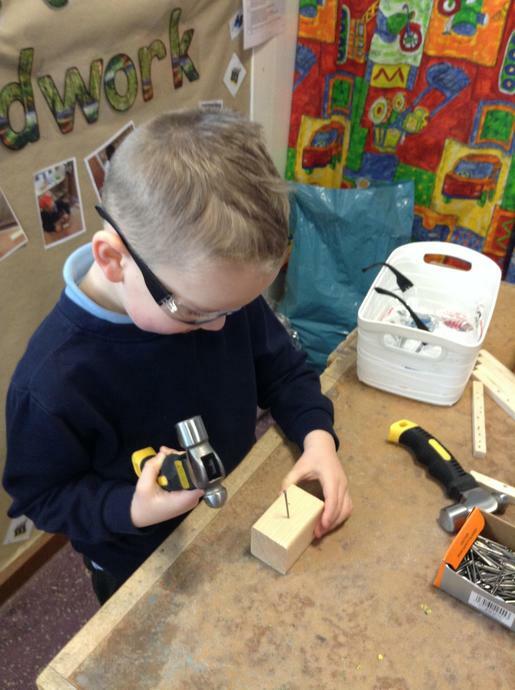 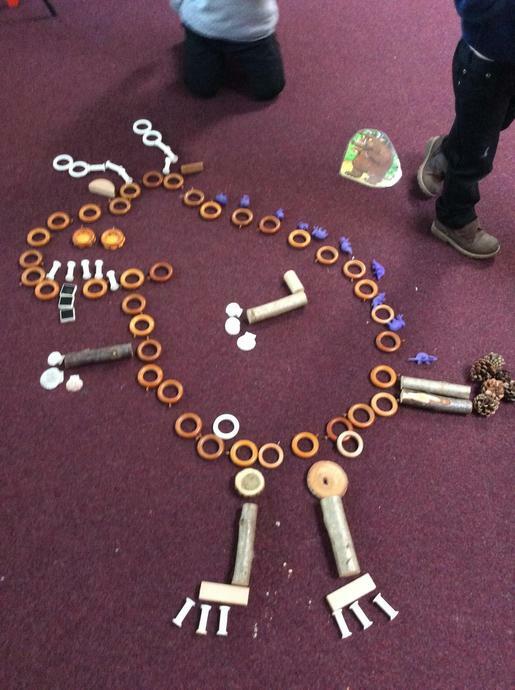 Mrs Mitchell went on a course to help us incorporate woodwork into Ladybirds and Sparrows. 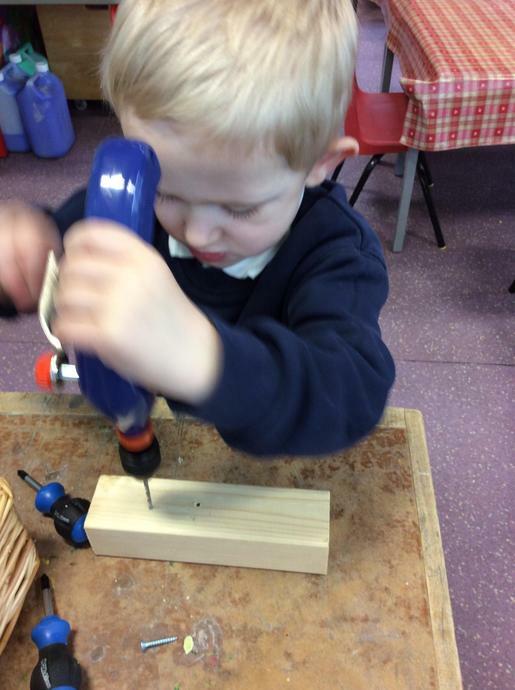 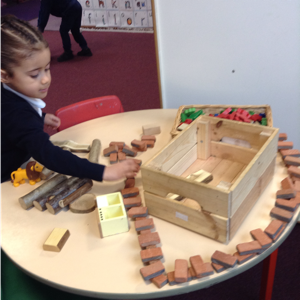 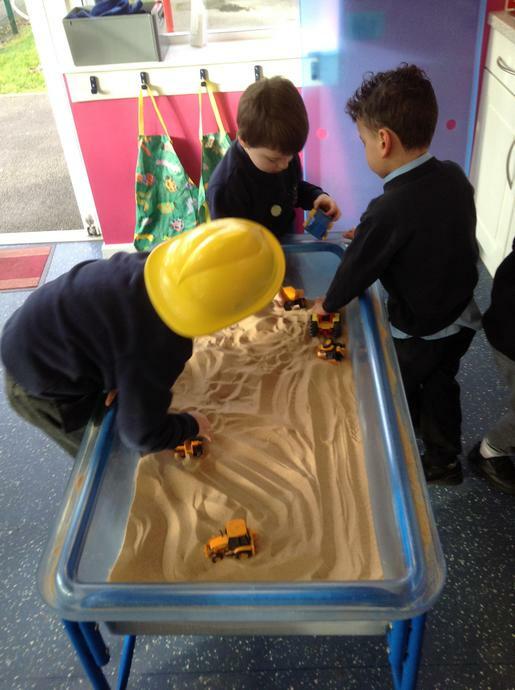 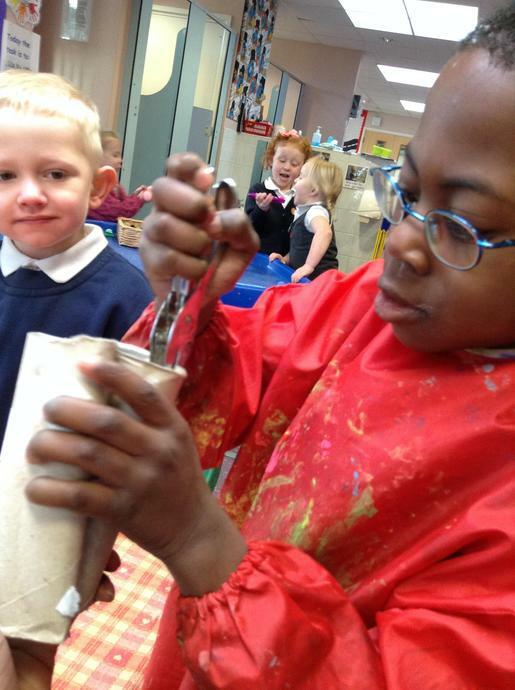 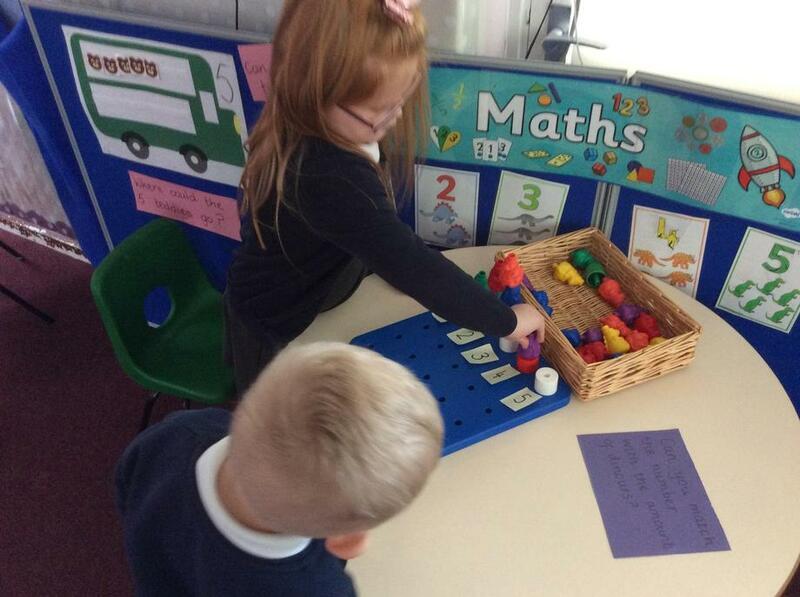 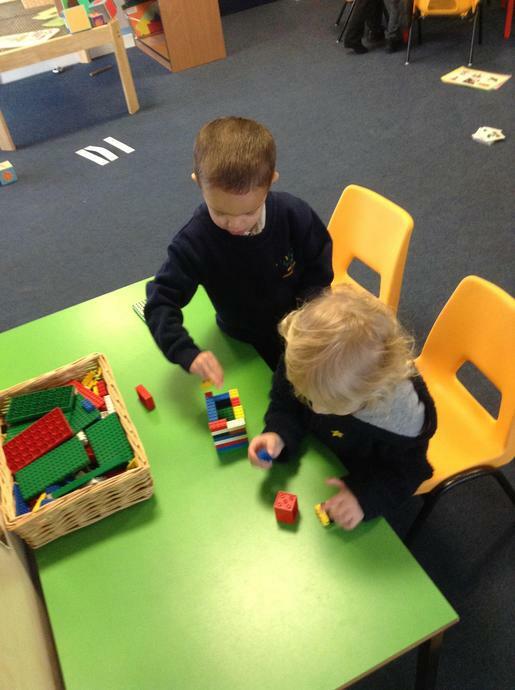 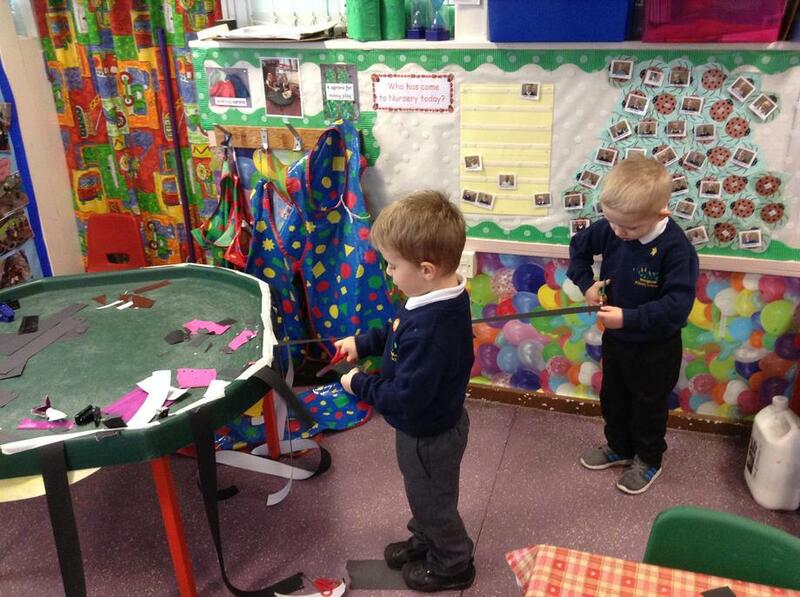 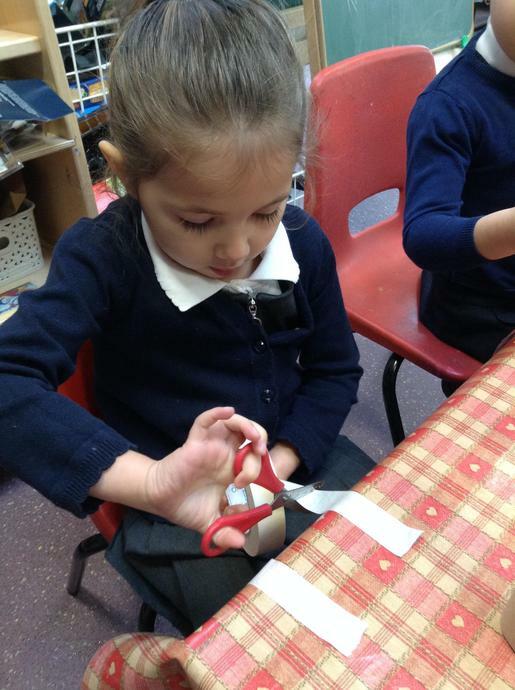 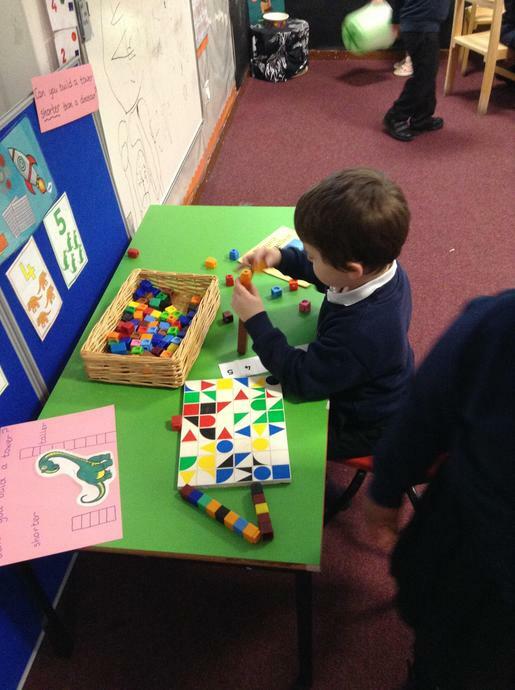 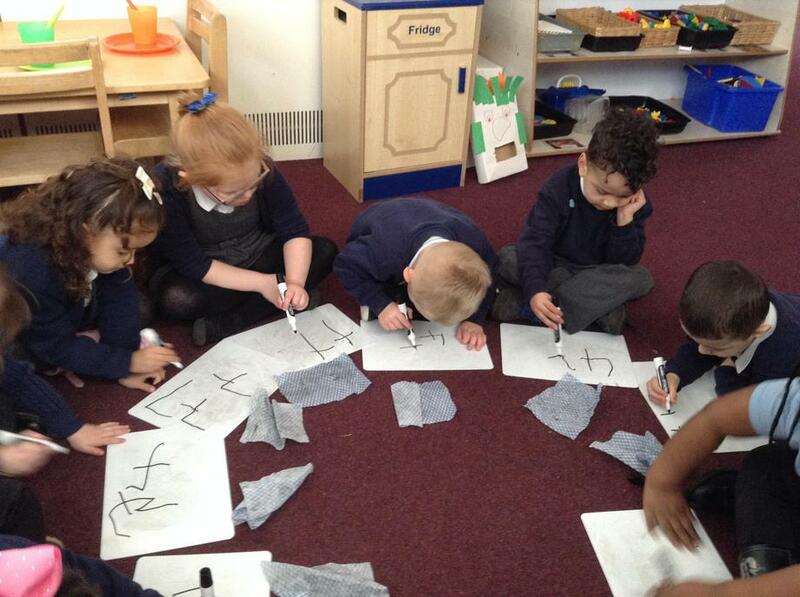 We have started to work with the children 1 by 1 to show them how to use different tools. 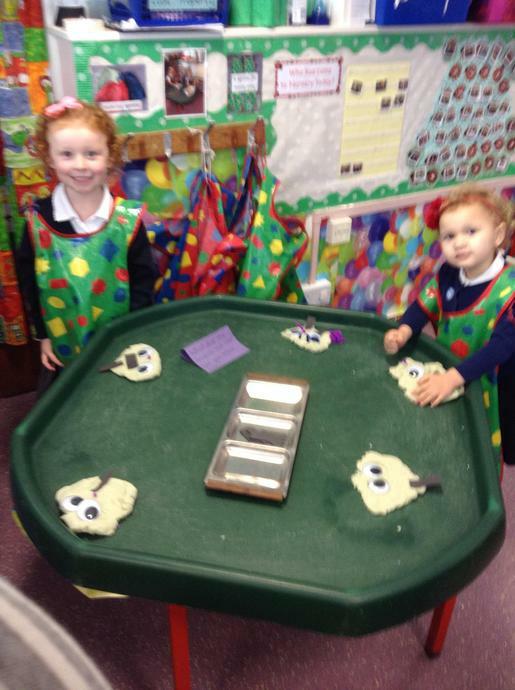 As you can imagine, they have been very excited to get 'stuck in'! 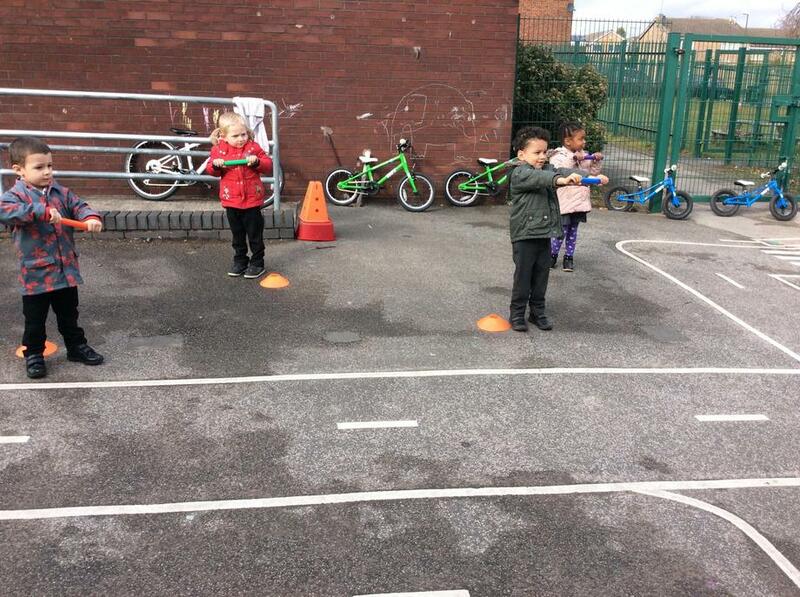 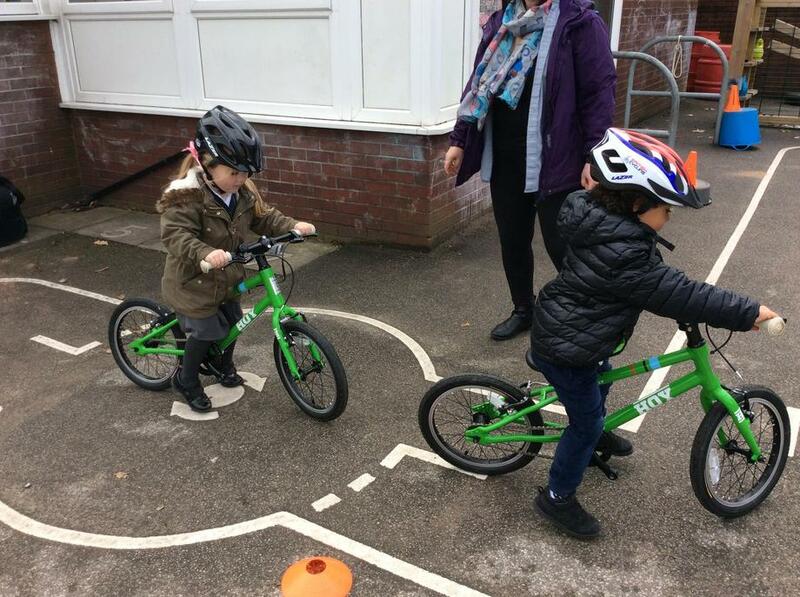 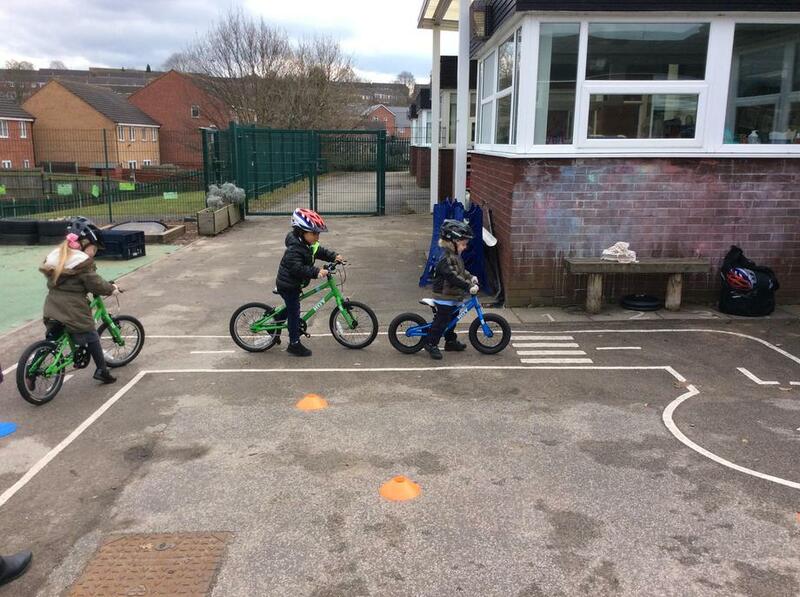 Thanks to Mrs Pomeroy, we have been able to access some free biking skills sessions. 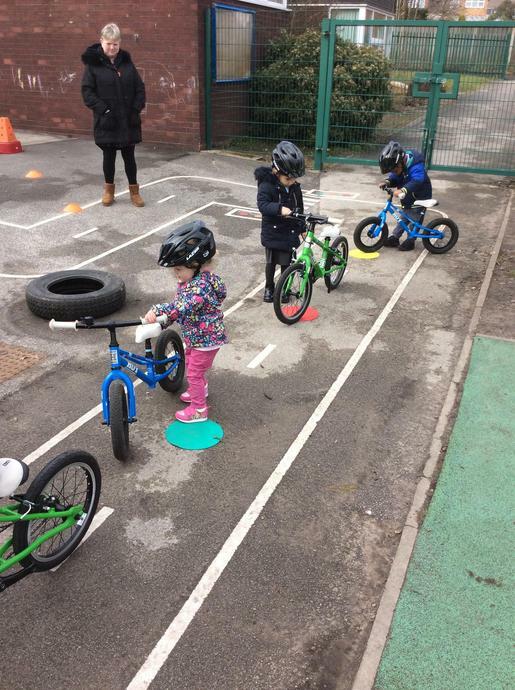 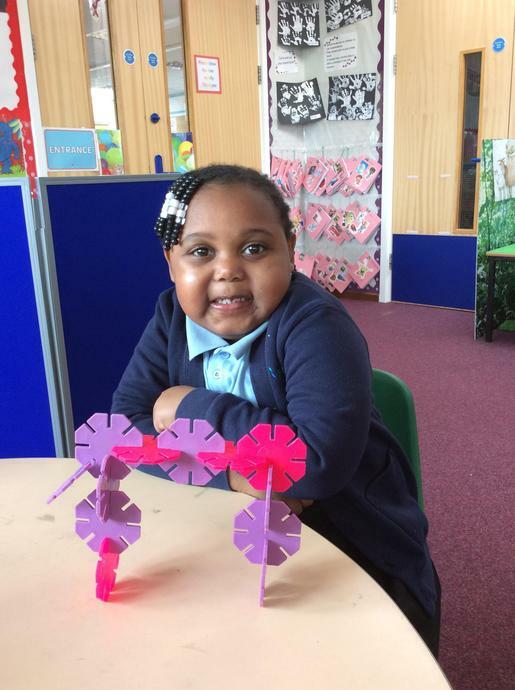 These support the children in balancing and strengthening their muscles ready to use on balance bikes. 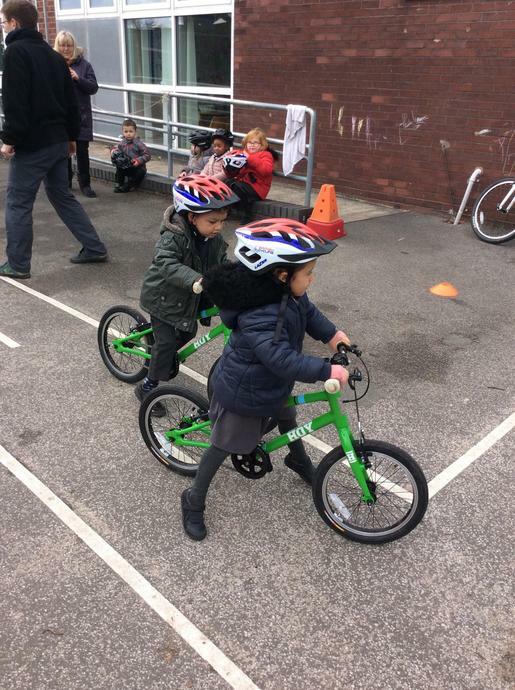 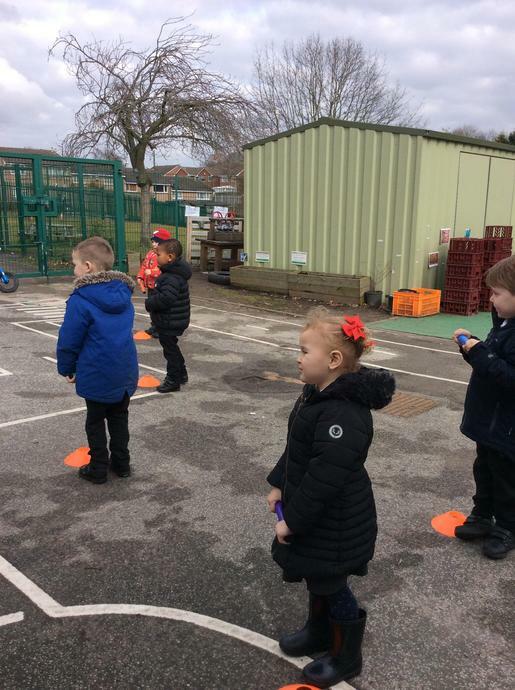 The children are absolutely loving using the balance bikes and our teacher (Mr Simpson) is great at developing our skills. 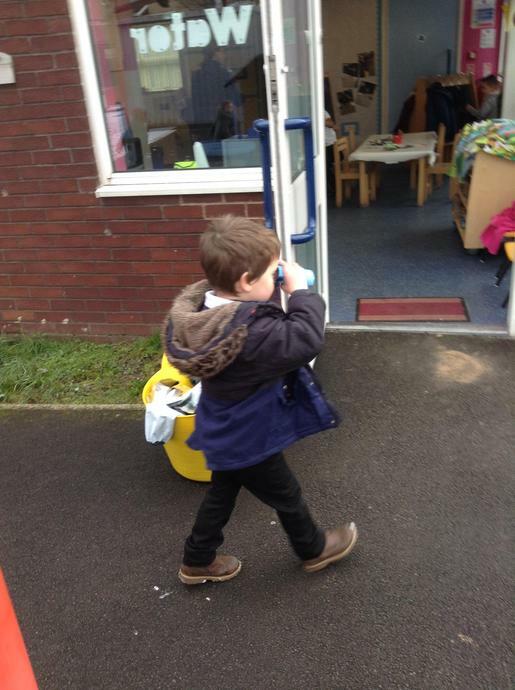 Keep a look out on the door to Ladybirds where we will be displaying photos as we go along. 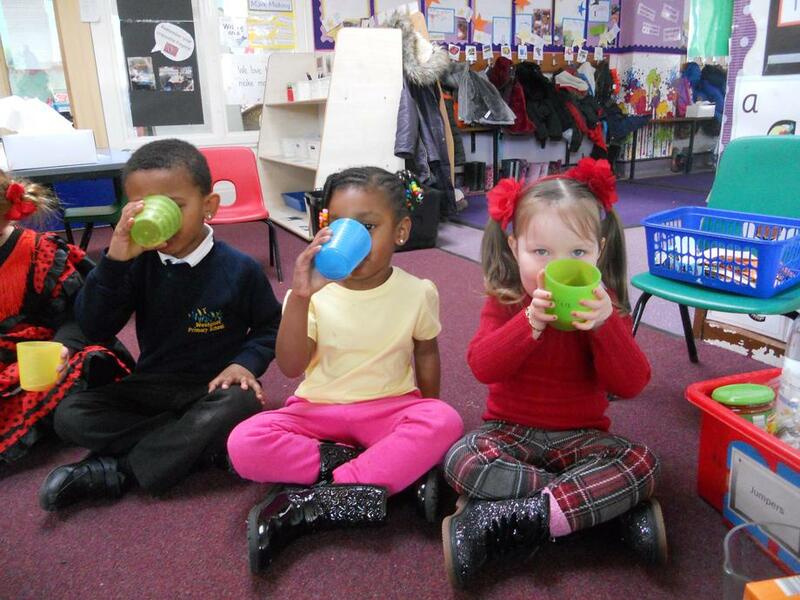 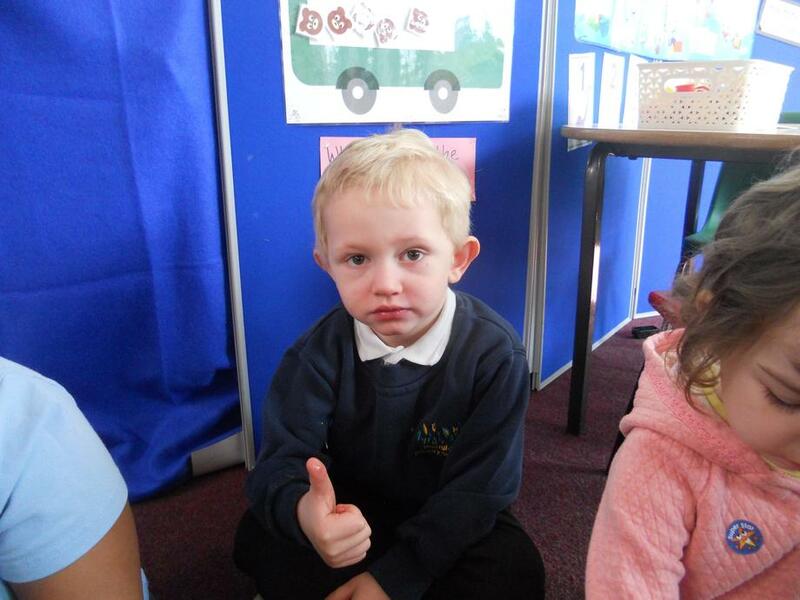 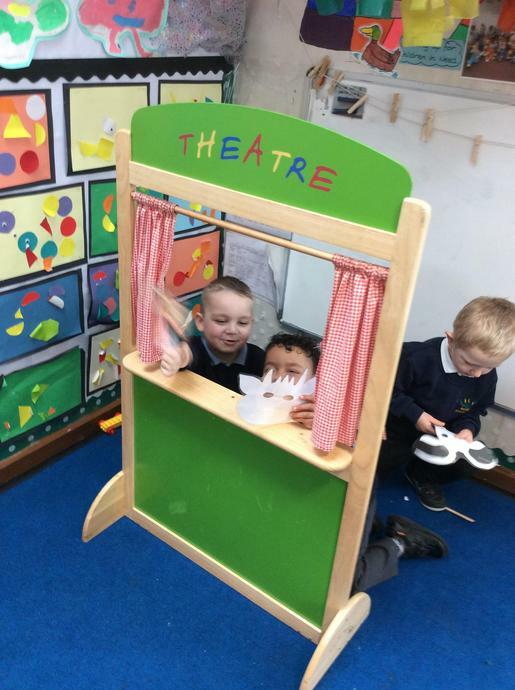 This week we have been listening to the story, acting it out with sound effects! 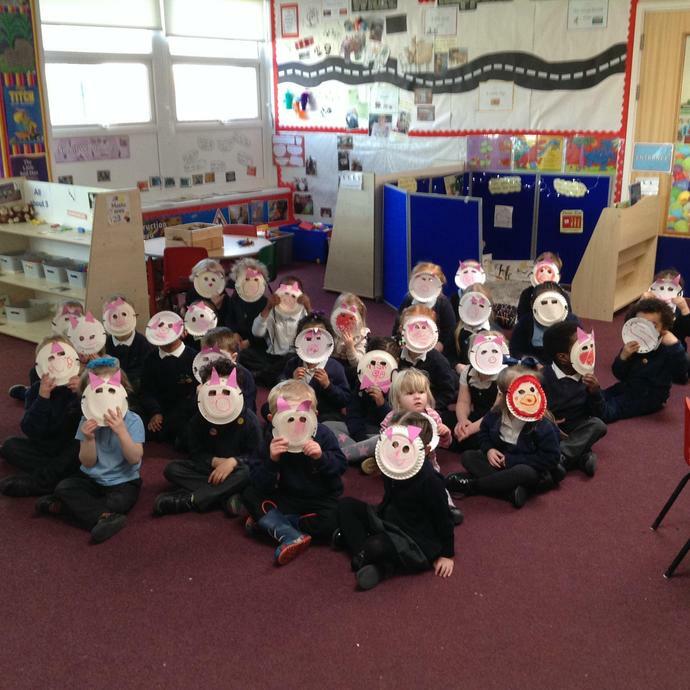 We all made a mask as part of our Rainbow Challenge! 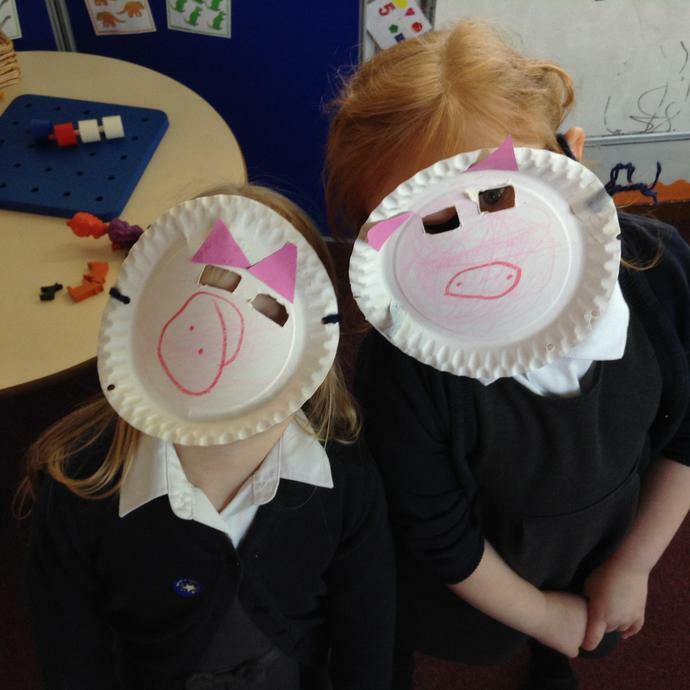 We had lots of fun and enjoyed role playing the pasrt of the 3 little pigs! 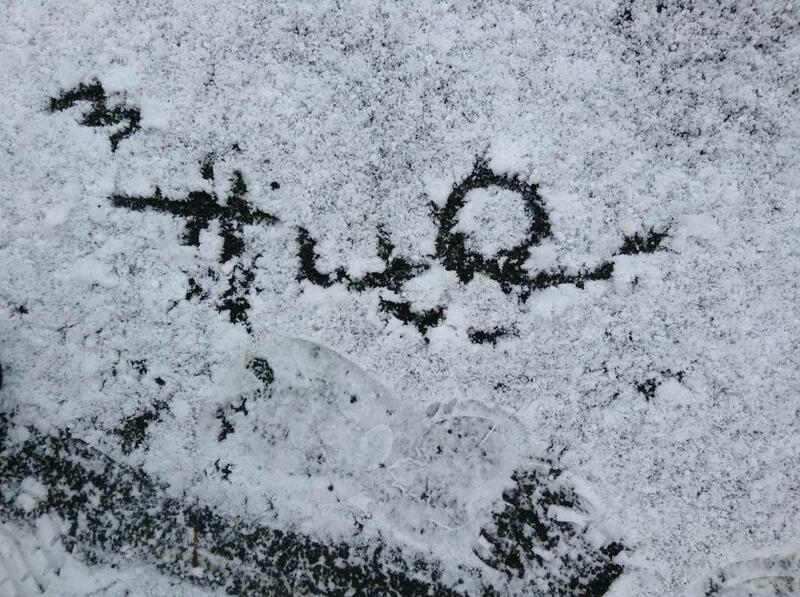 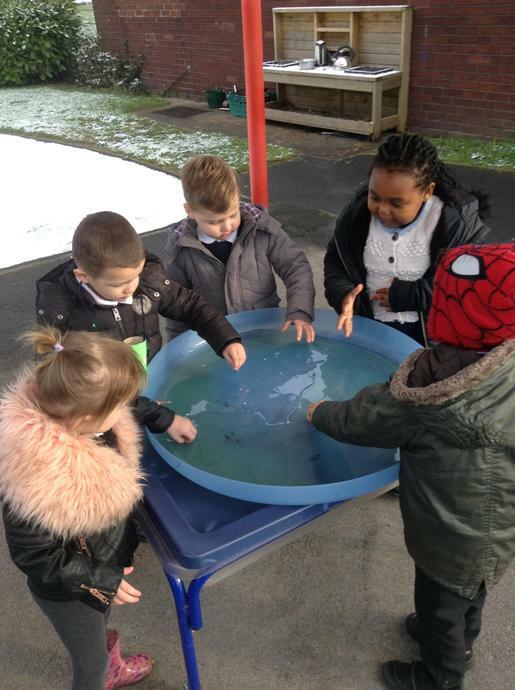 We also enjoyed the last of the snow! 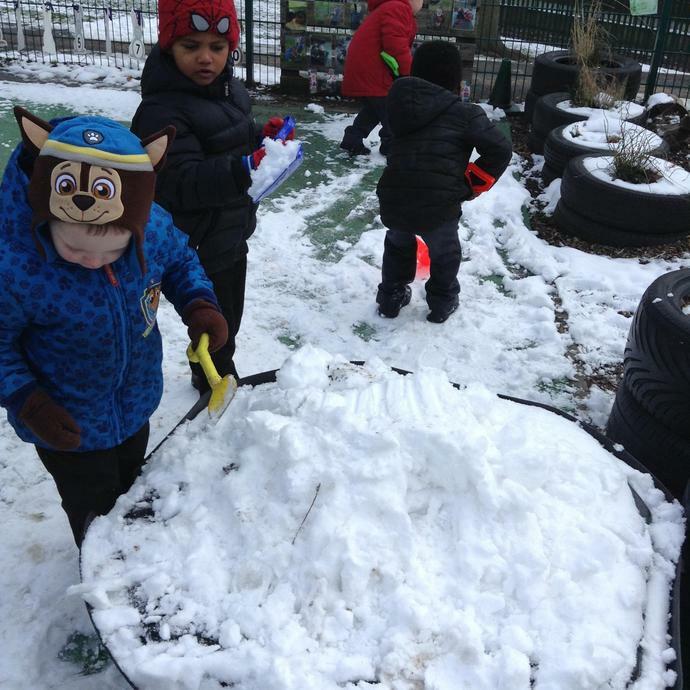 This week was slightly shorter than it should have been due to the Beast from the East showing a snowy appearance! 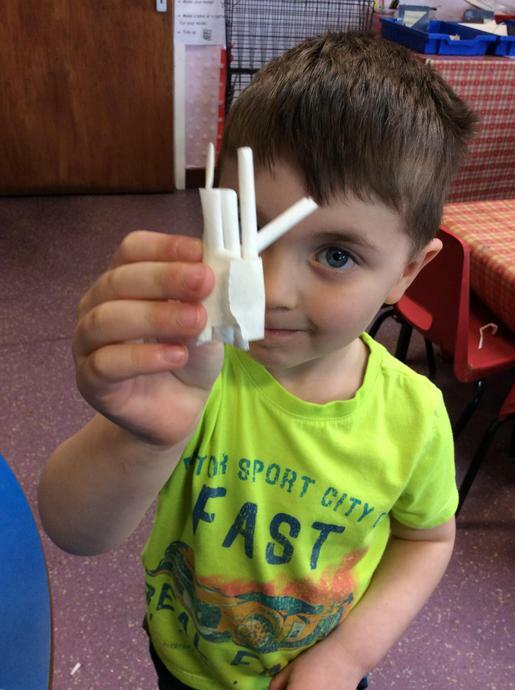 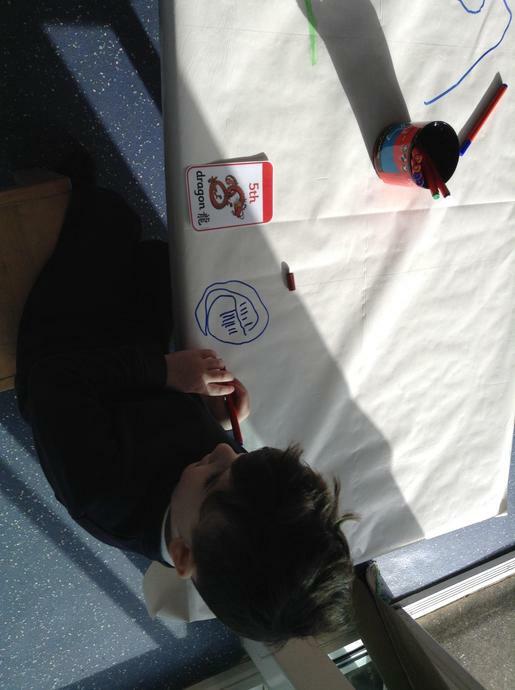 We still managed to have looks of fun including making our own Chinese Dragon to dance with, writing in Chinese and finding letters in the noodles with chop sticks! 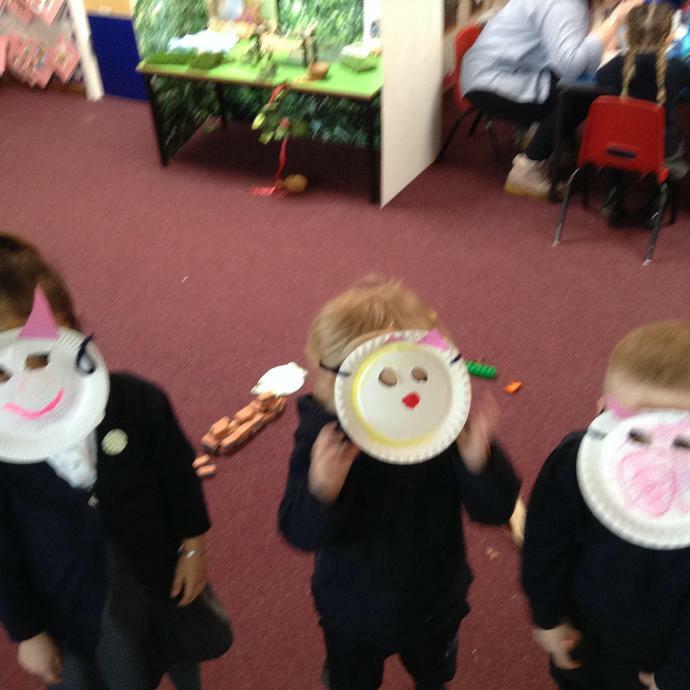 Spring 1 - What are these fantastic beasts? 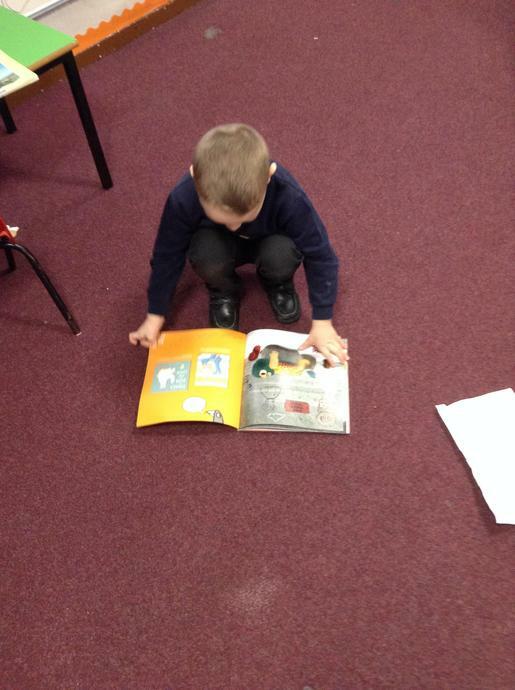 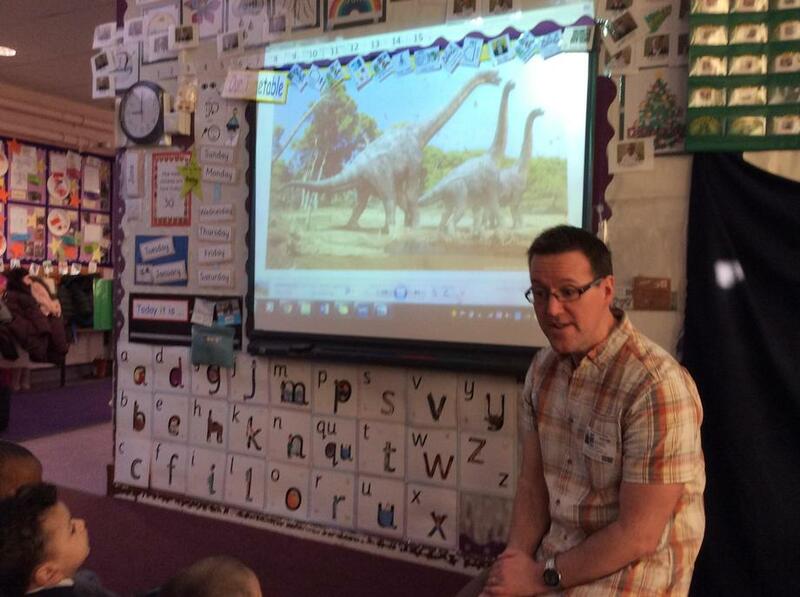 This term we are looking at different animals - fiction and real. 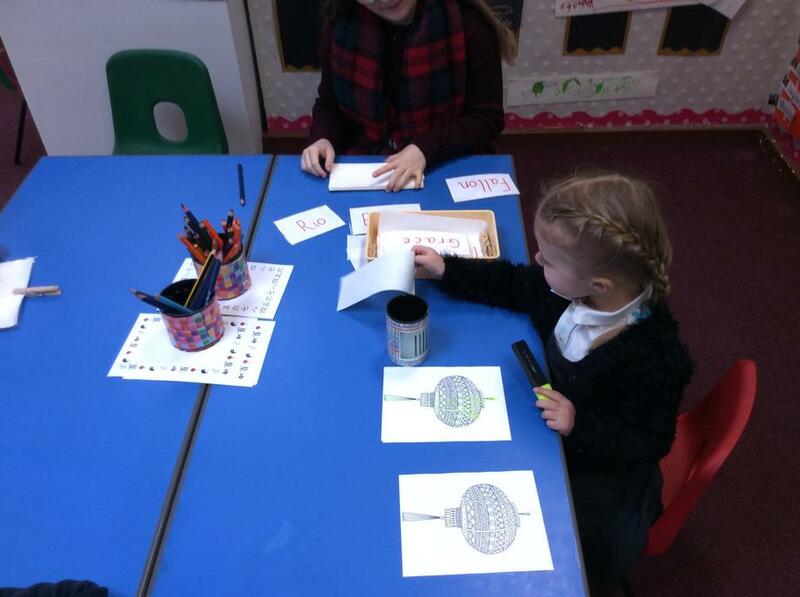 We hope that you will be able to share your knowledge and enthusiasm with the children! 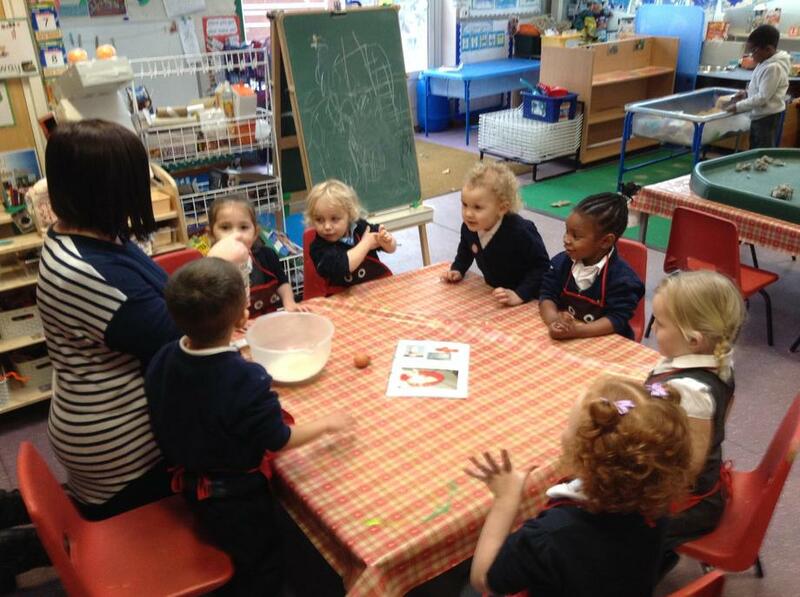 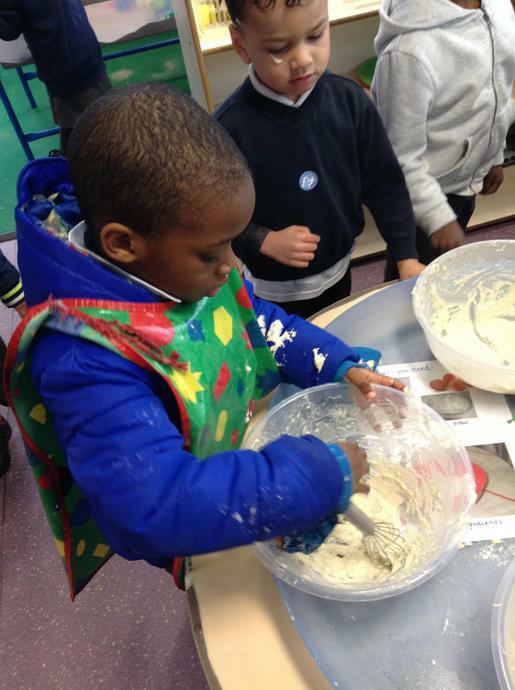 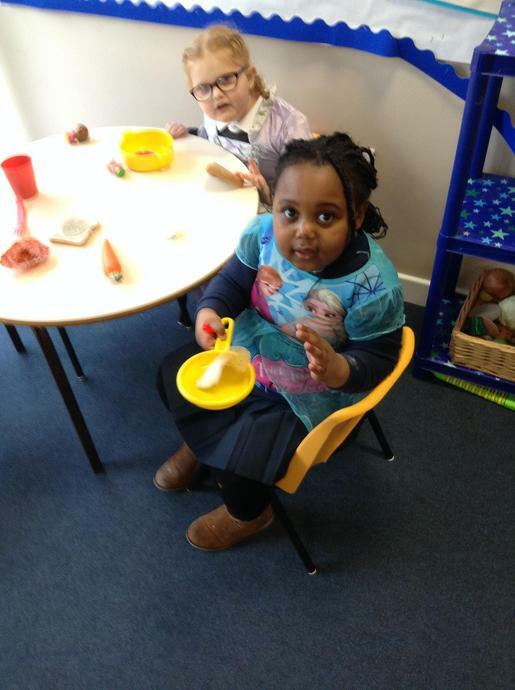 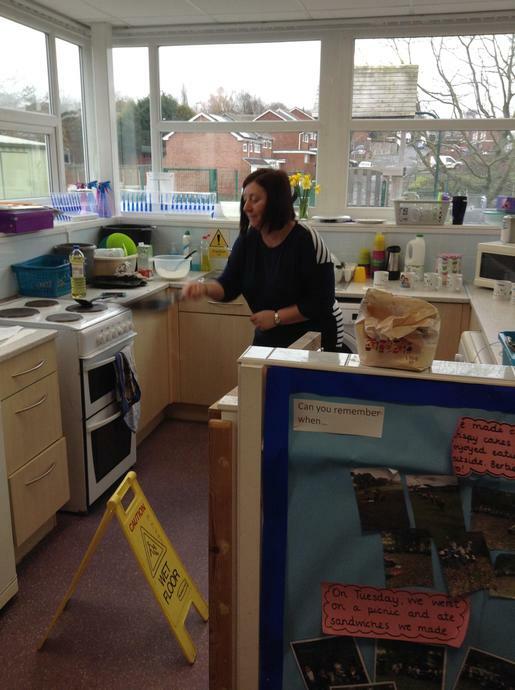 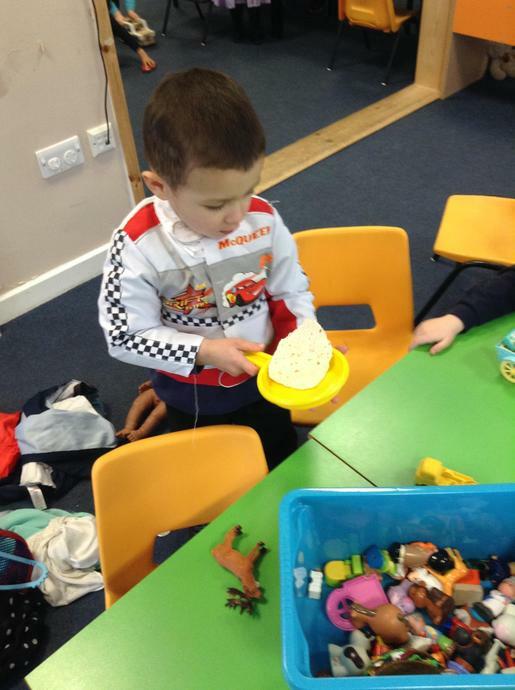 As part of our celebration of Pancakes, we had a variety of activities including making up the batter (reading simple instructions), flipping pretend pancakes in the home role play area, making a batch of pancakes and finally eating pancakes and discussing what we enjoy having with our pancakes! 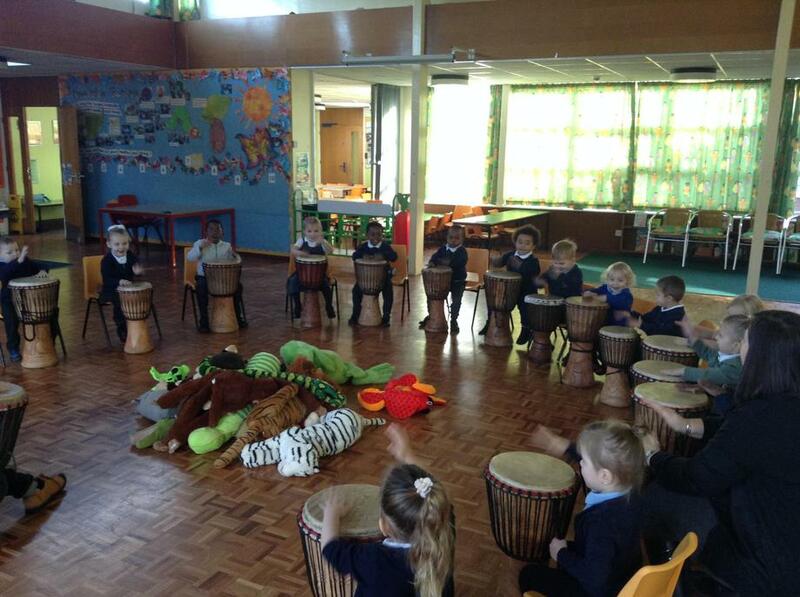 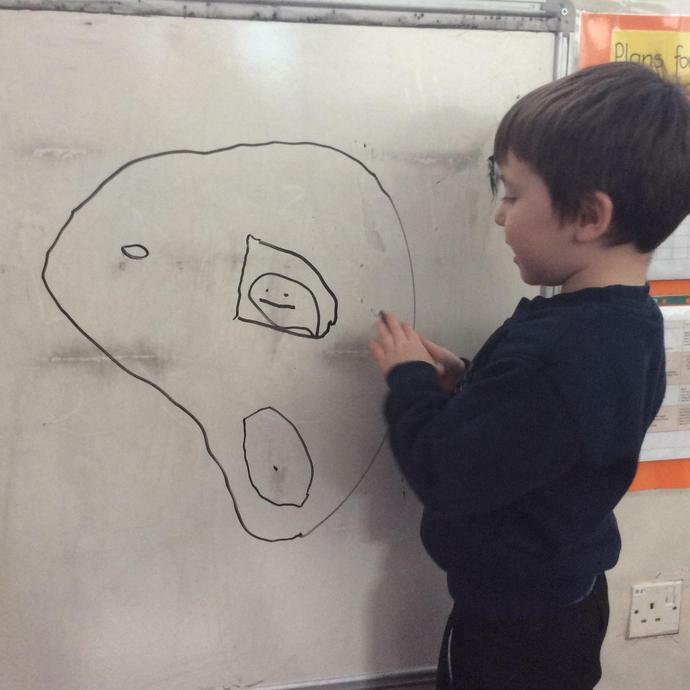 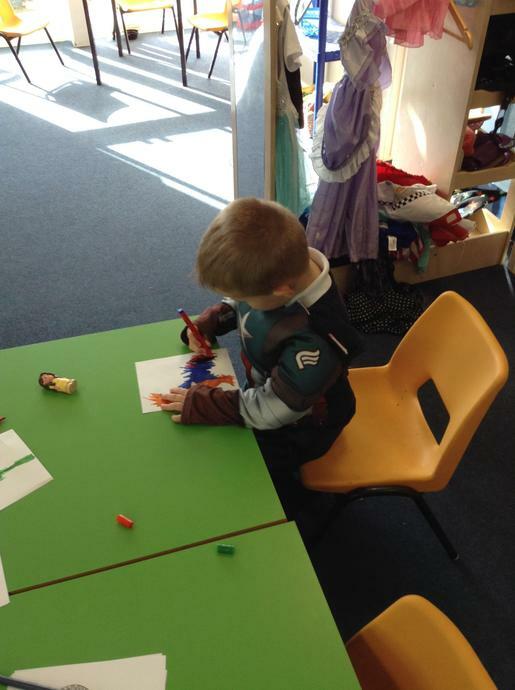 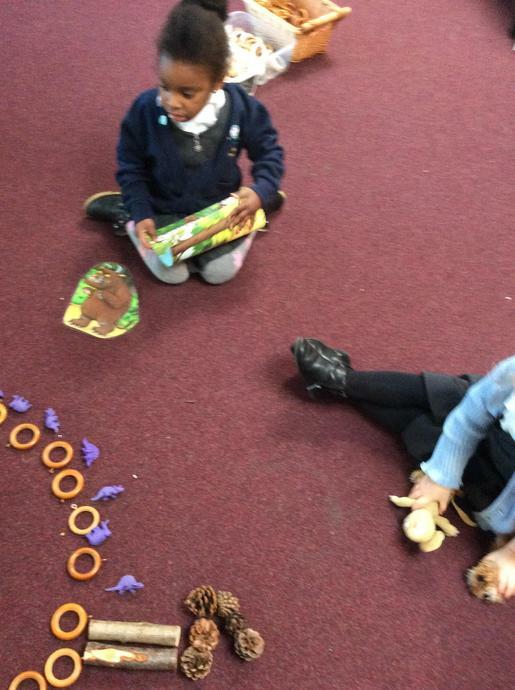 Over the last couple of weeks, we have been exploring fantasy creatures, looking at the Gruffalo story in particular. 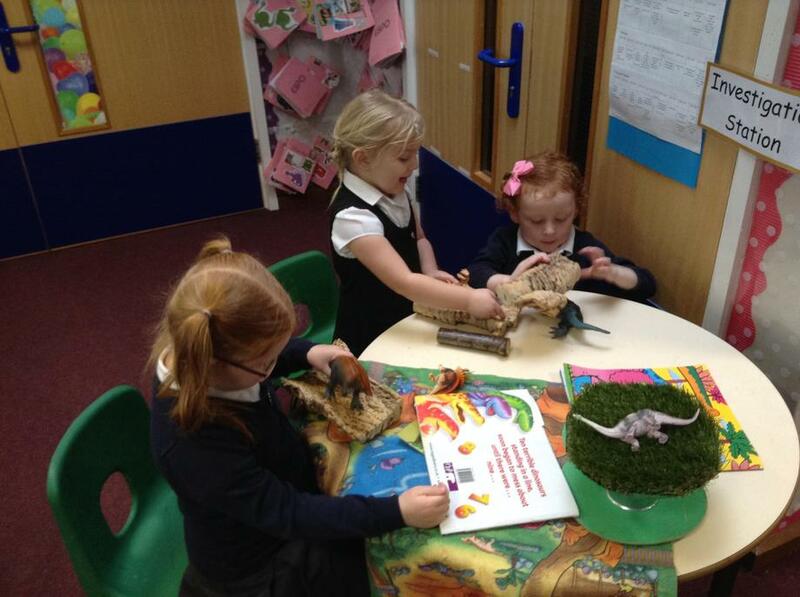 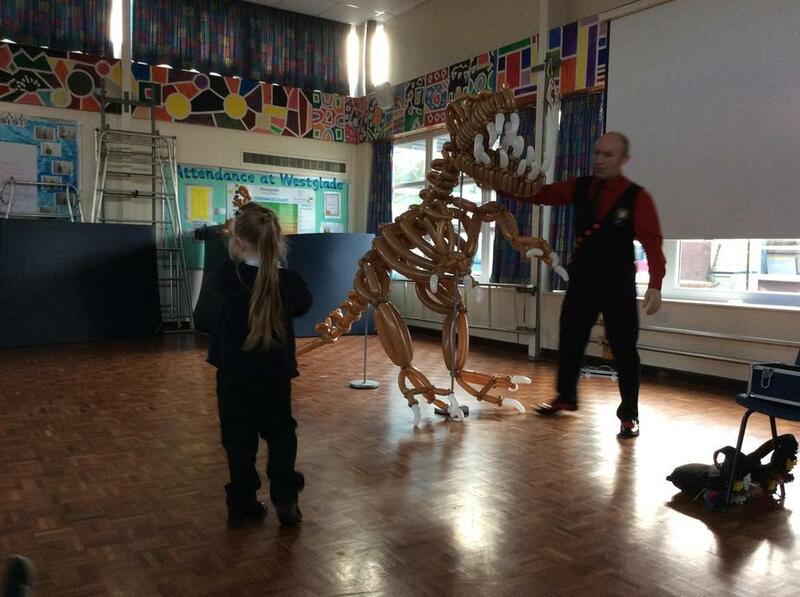 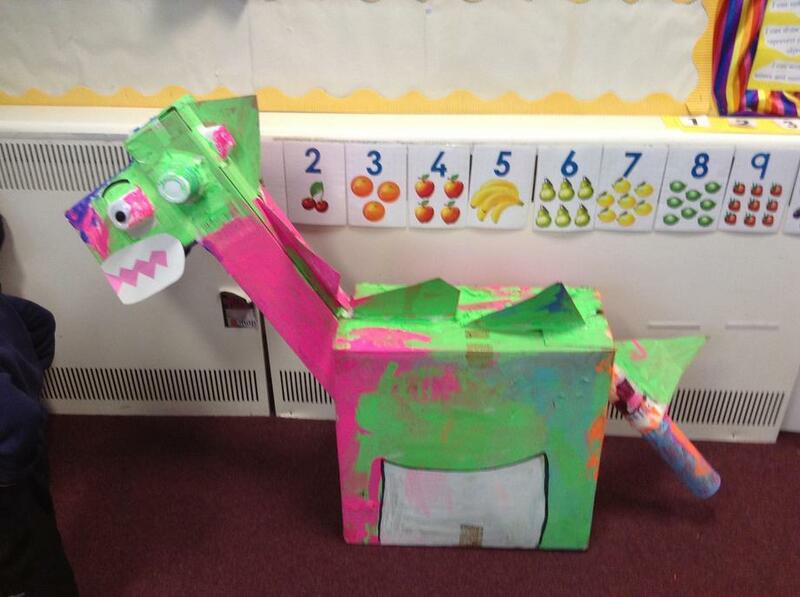 All the children have really enjoyed exploring and making up creatures. 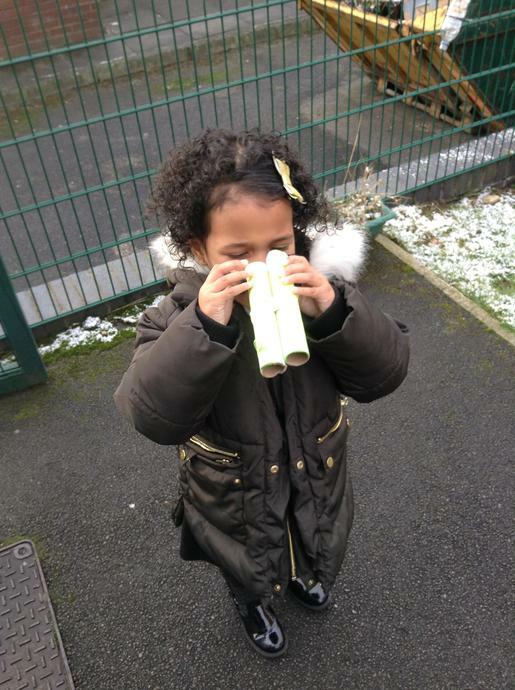 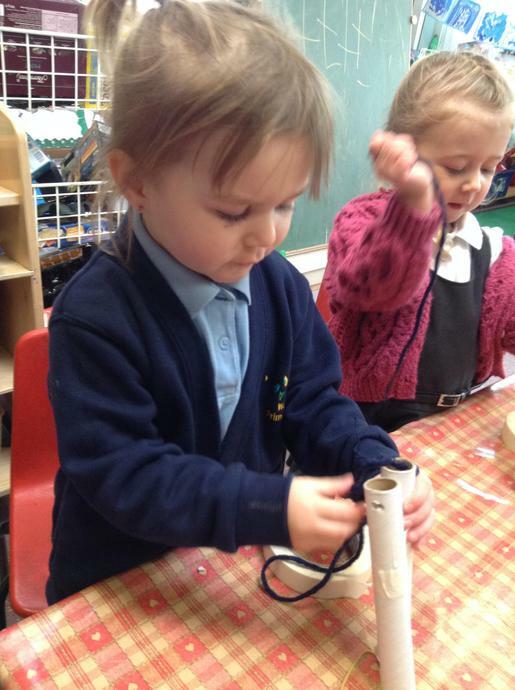 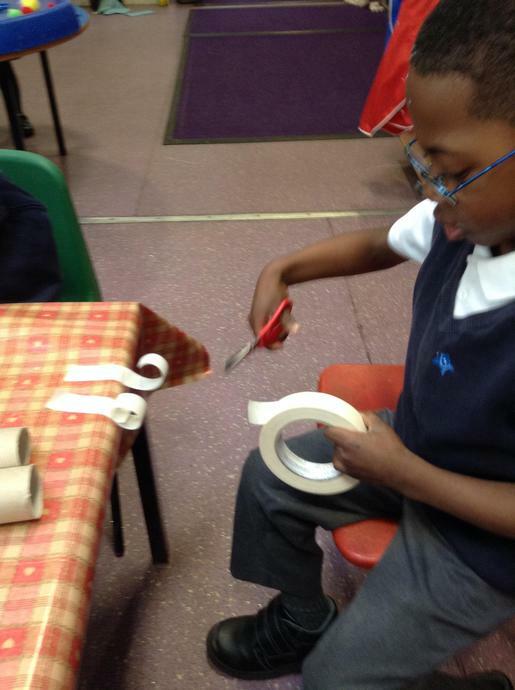 They used their fine motor skills to cut tape, hole punch and then thread the wool through the holes to make binoculars. 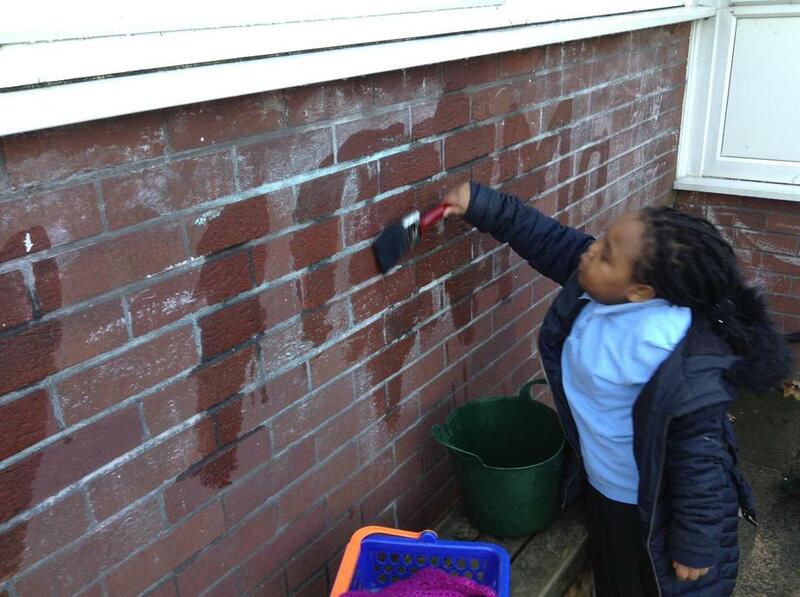 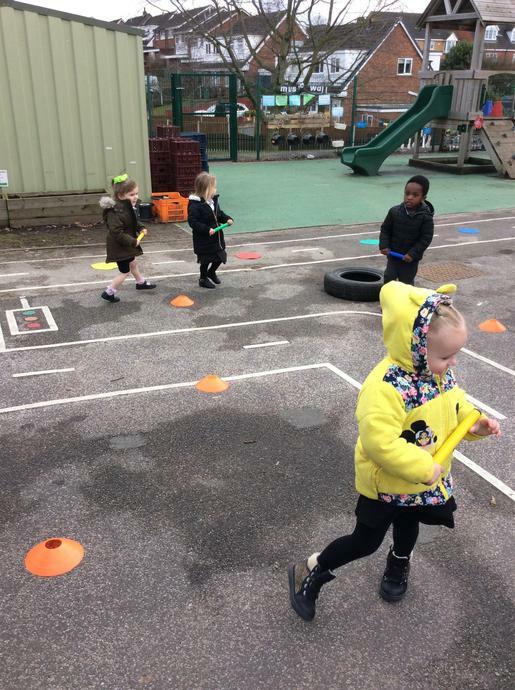 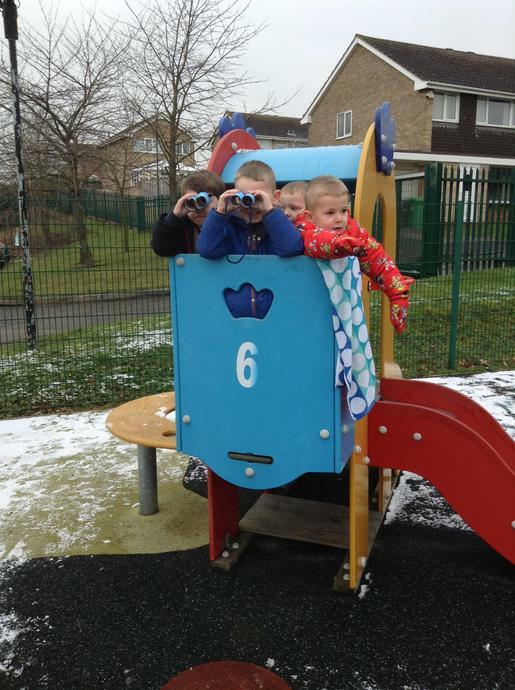 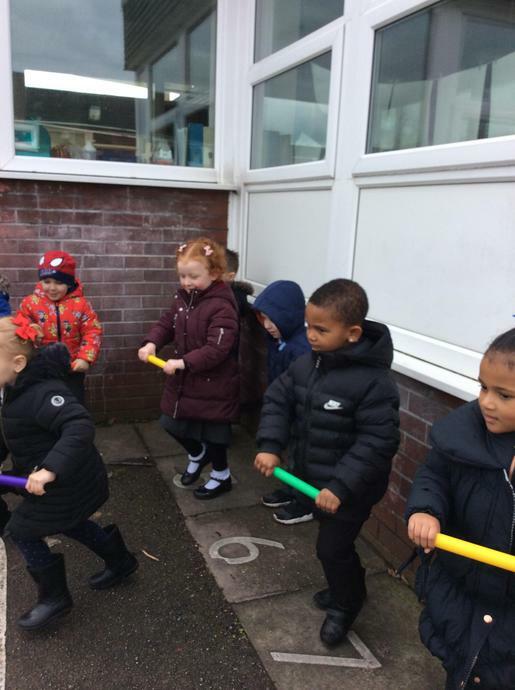 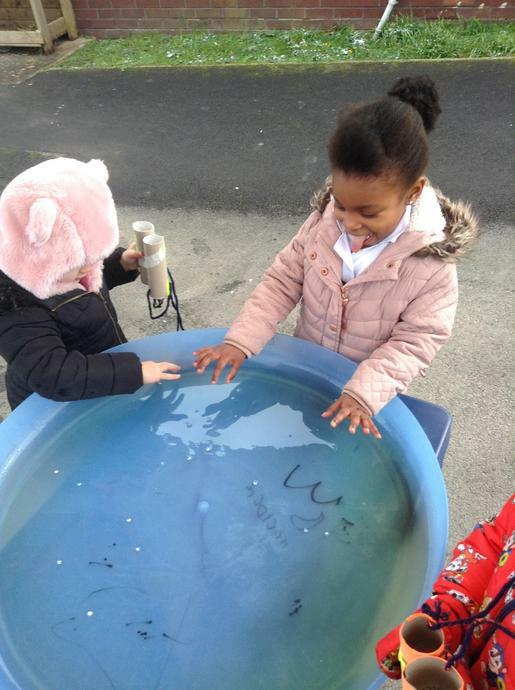 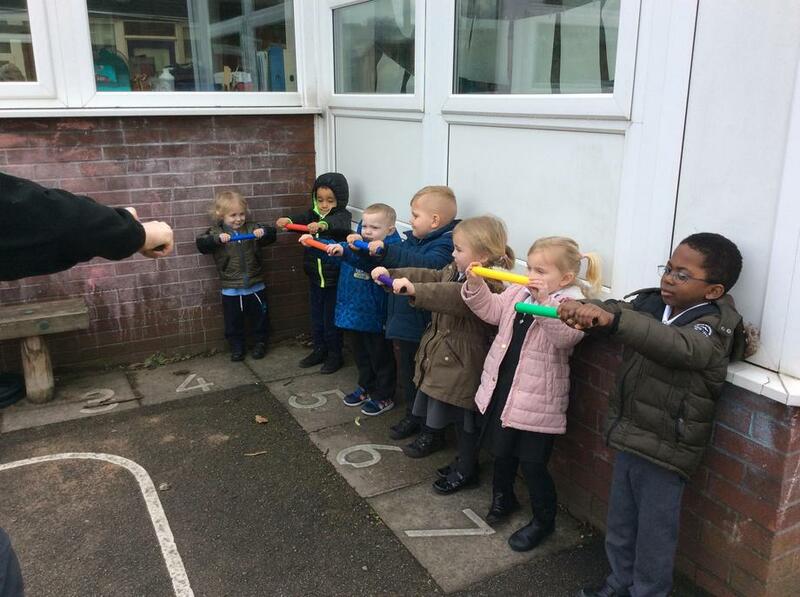 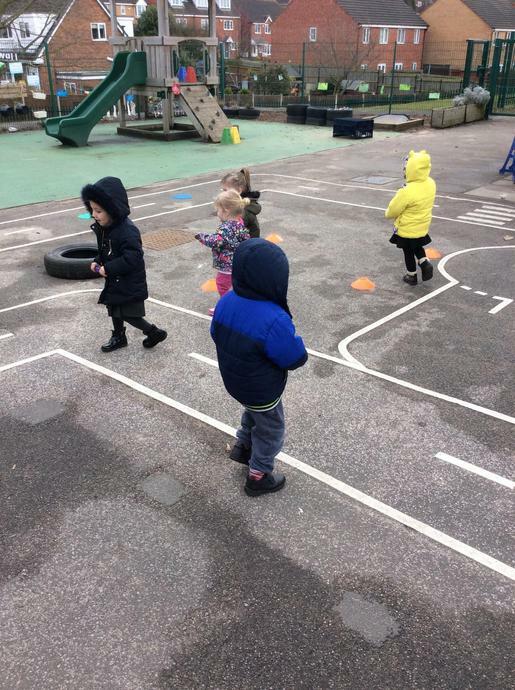 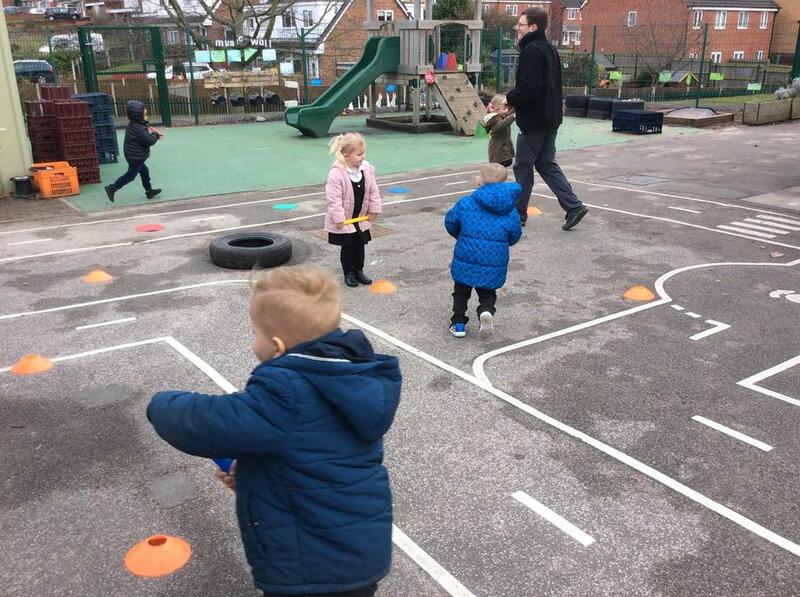 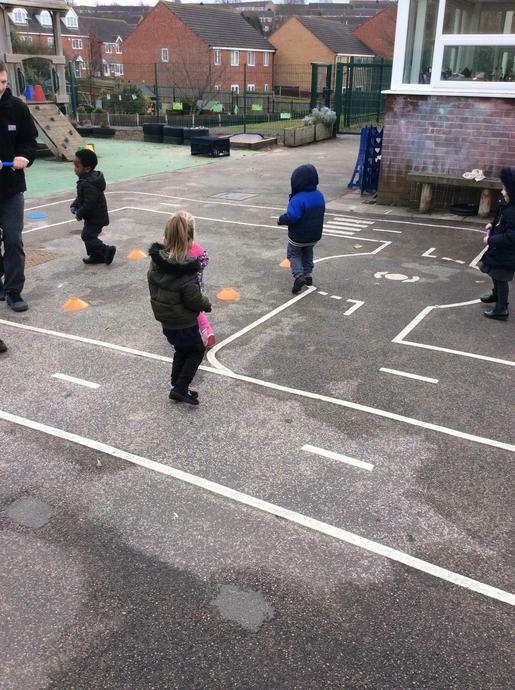 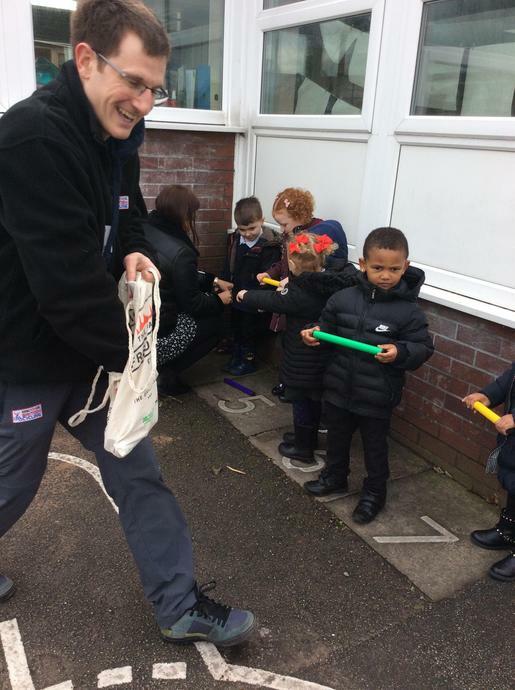 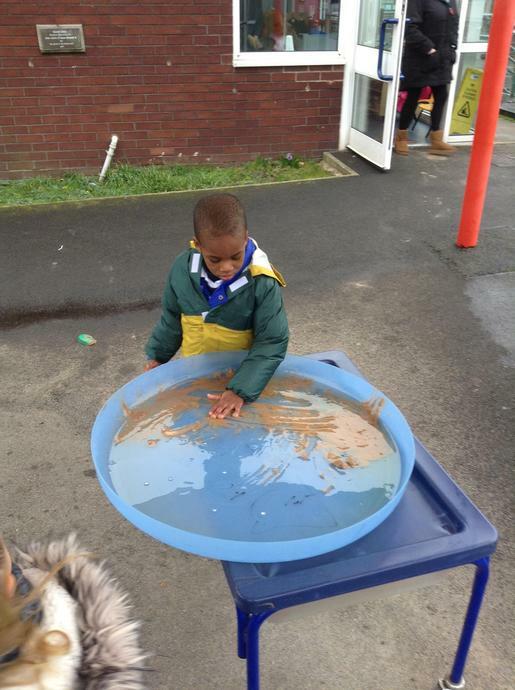 The children then went outside to try and find the monsters that left the monster slime....they had great fun!!! 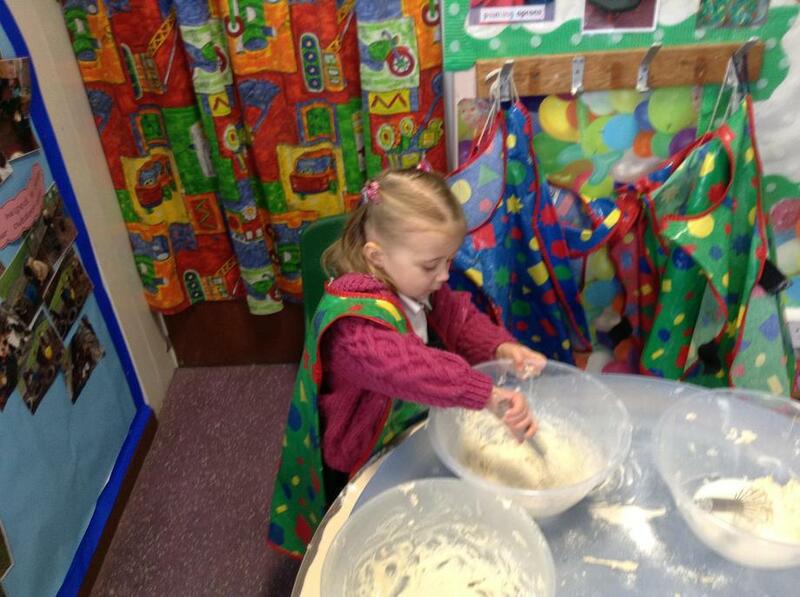 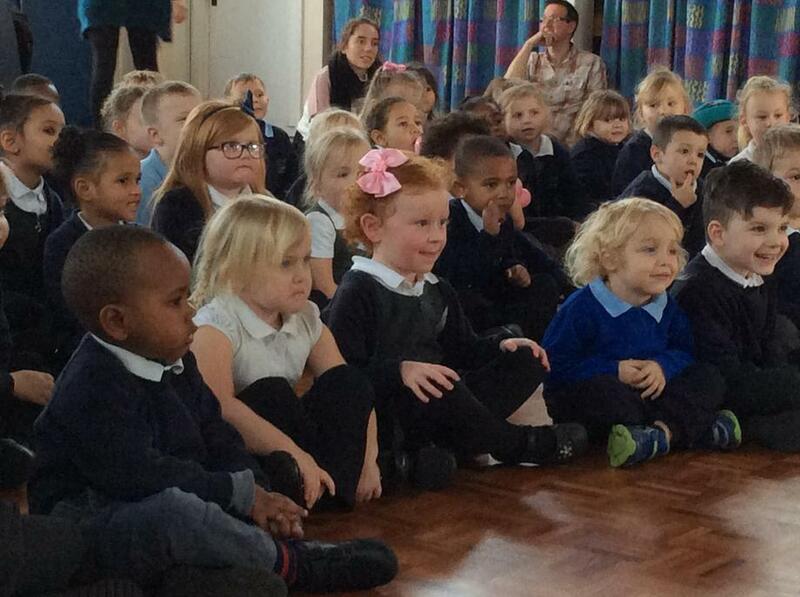 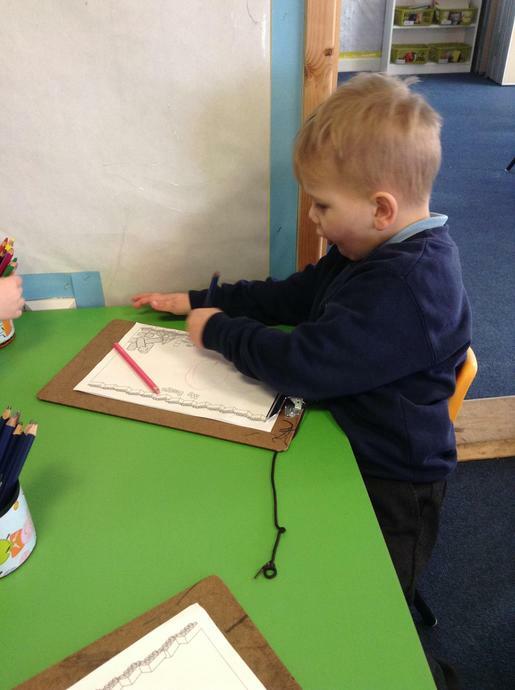 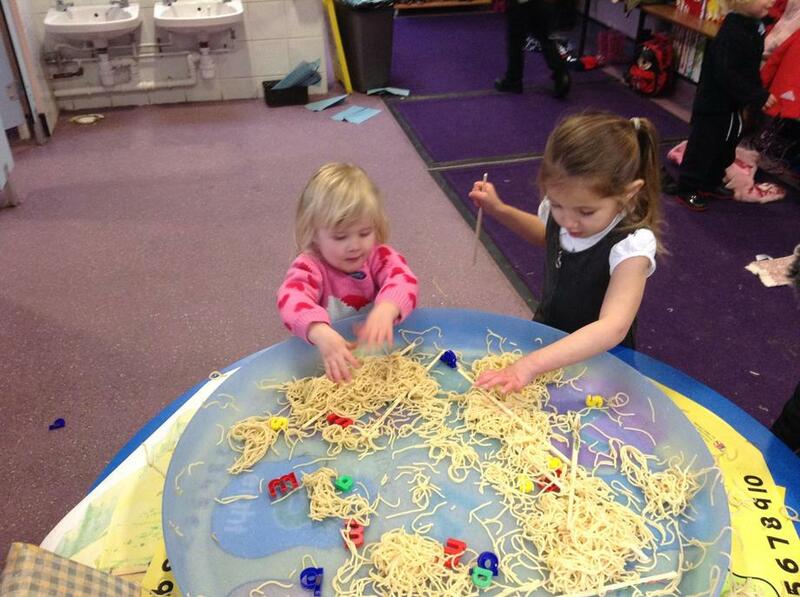 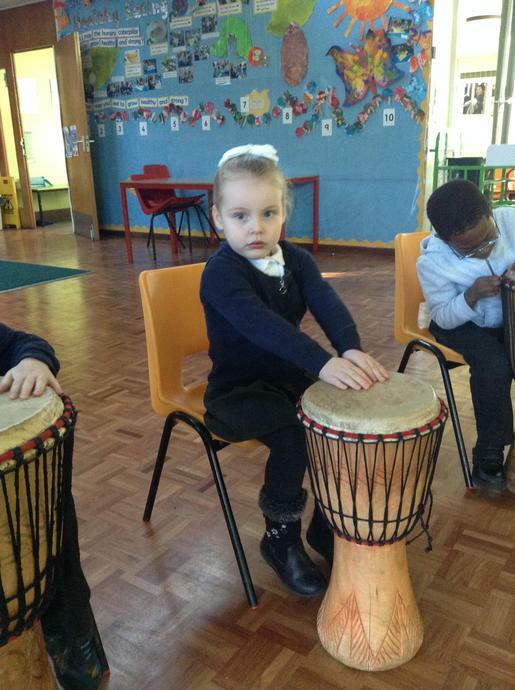 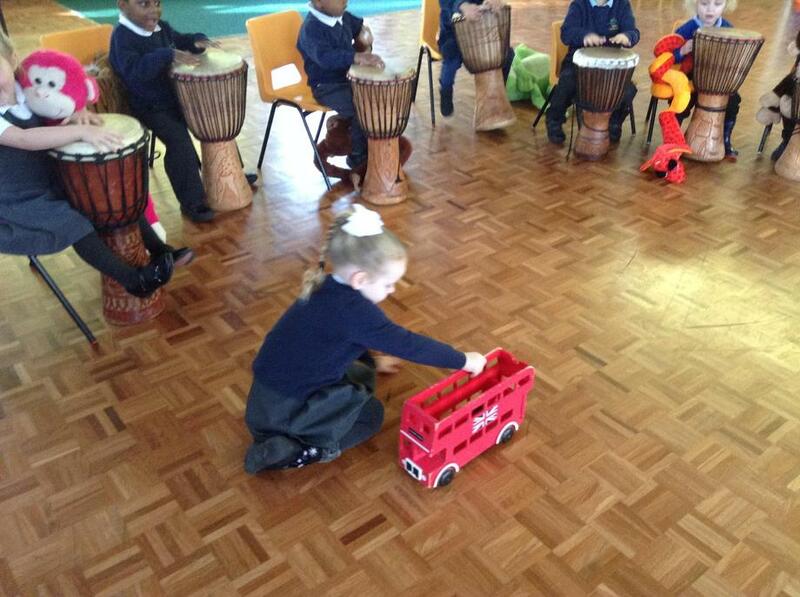 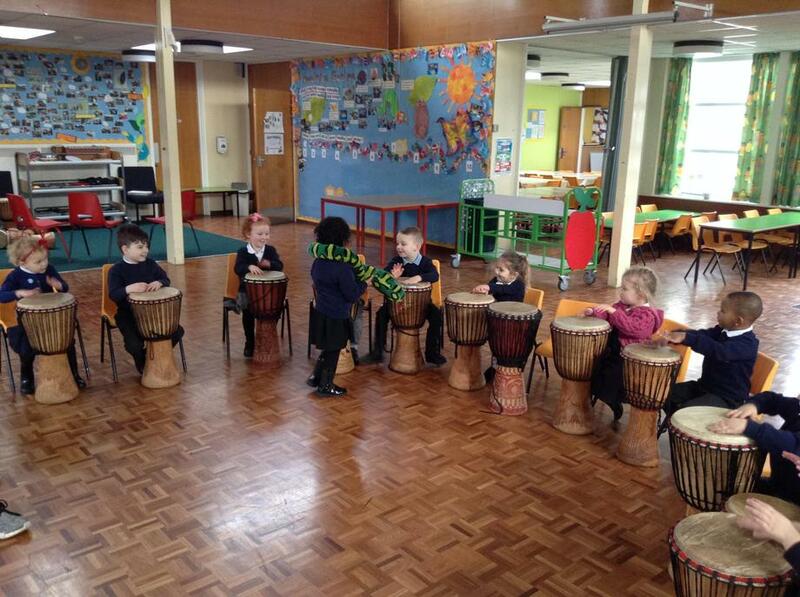 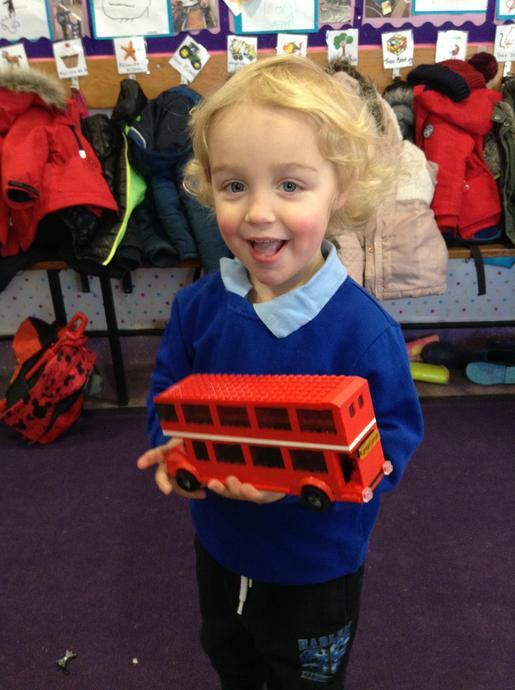 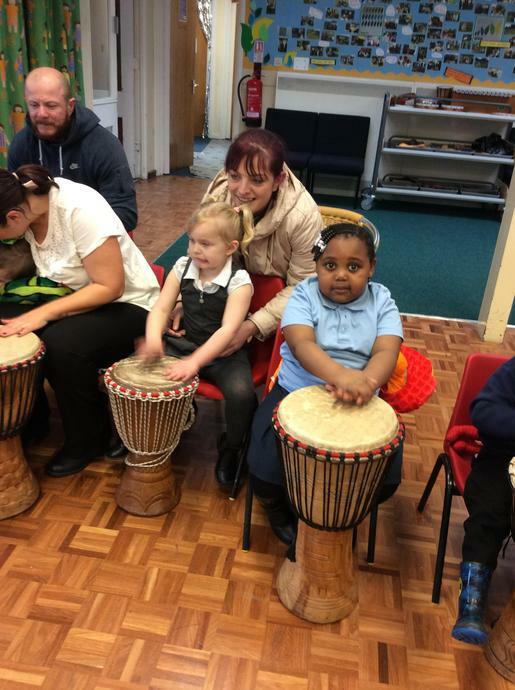 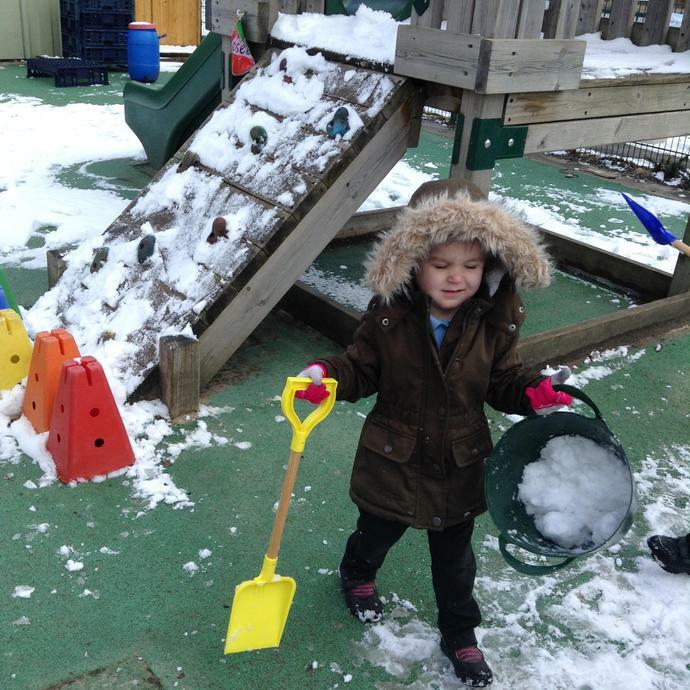 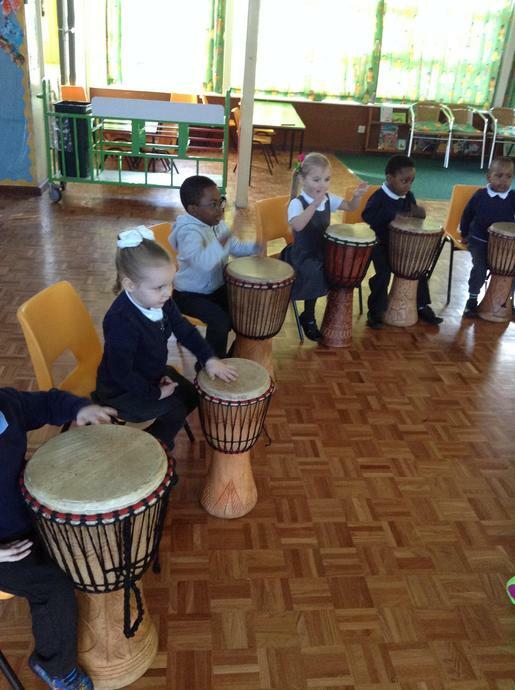 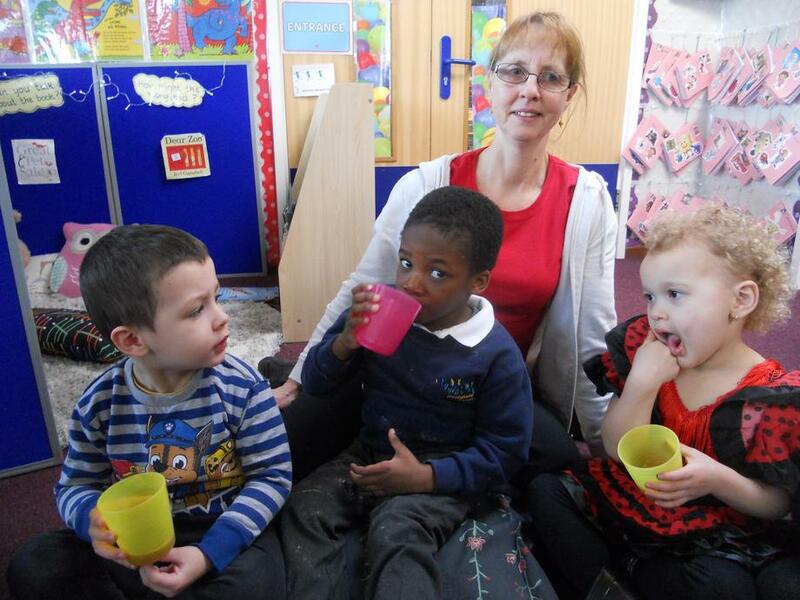 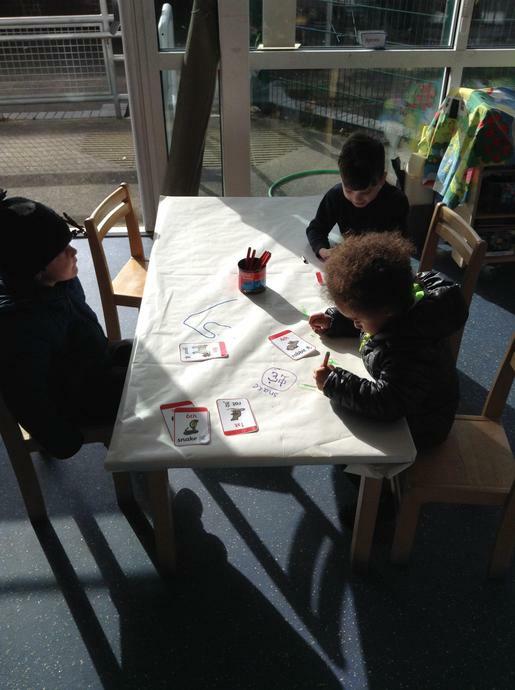 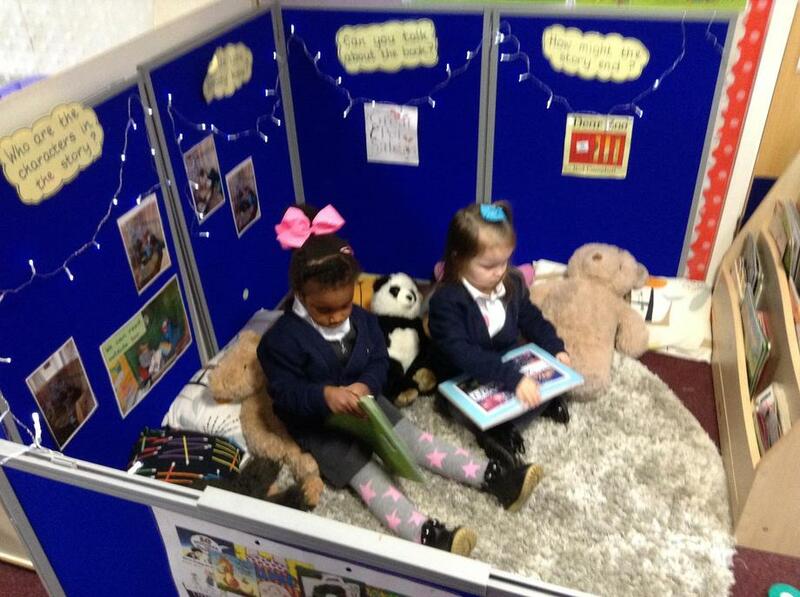 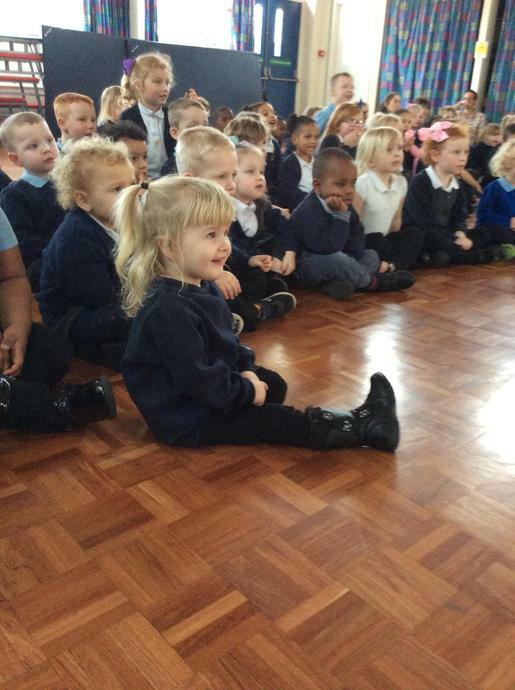 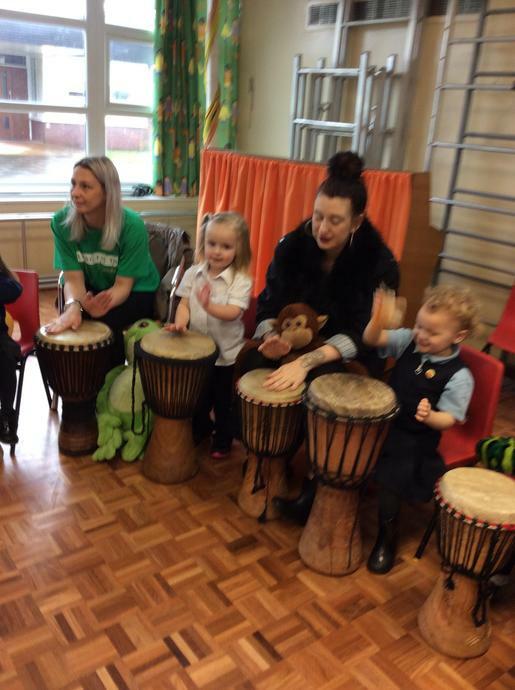 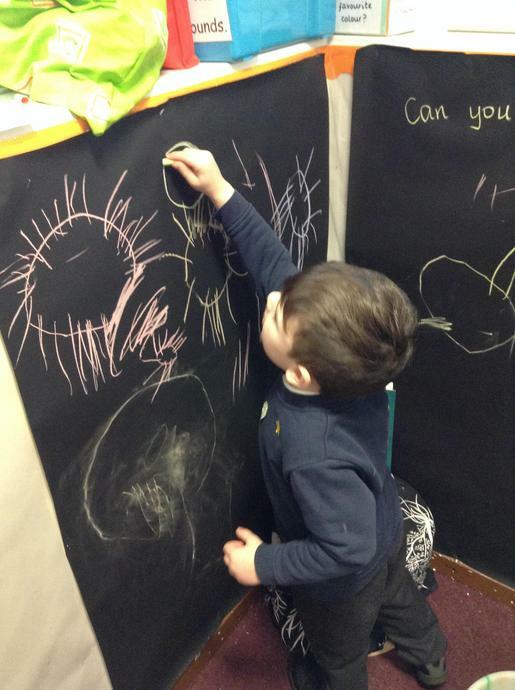 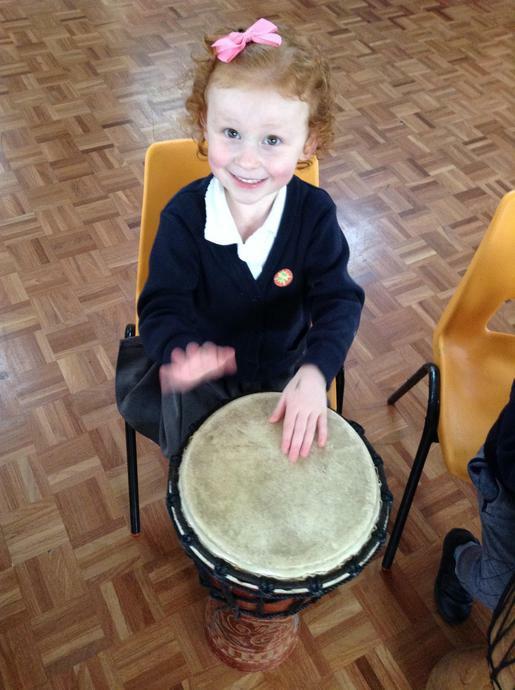 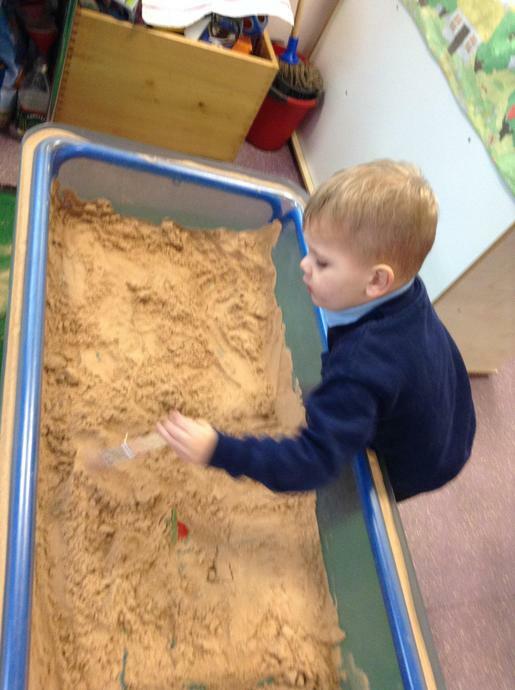 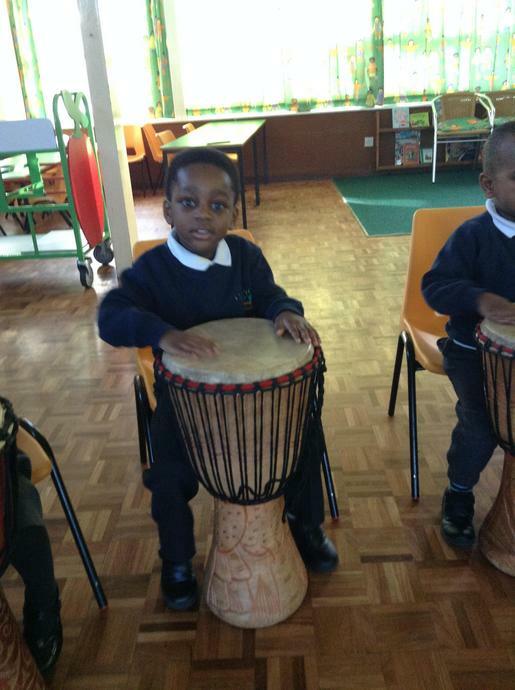 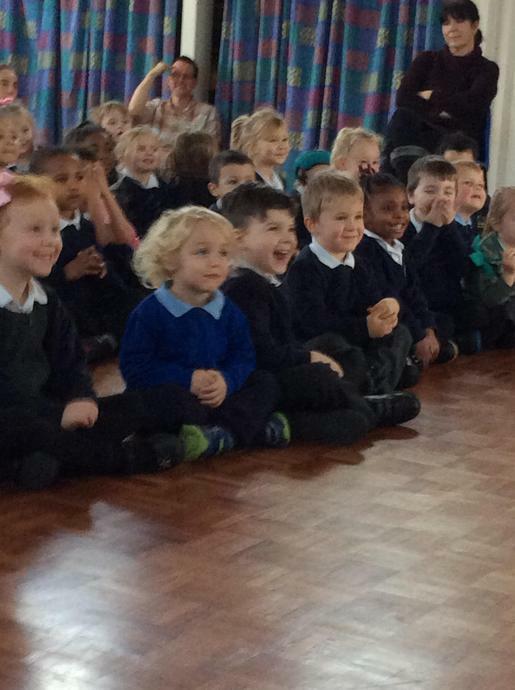 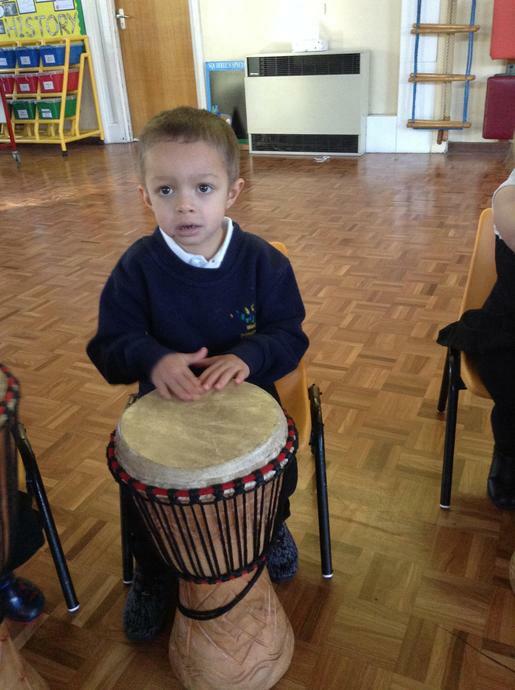 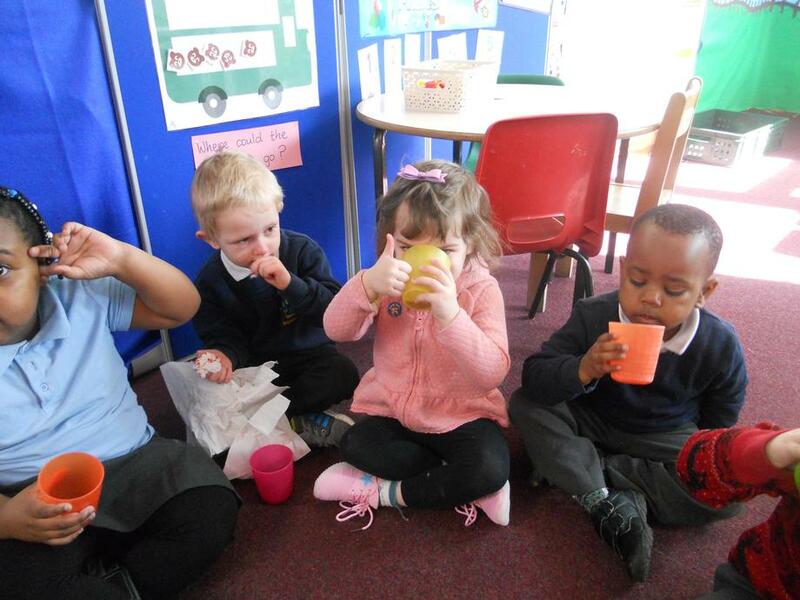 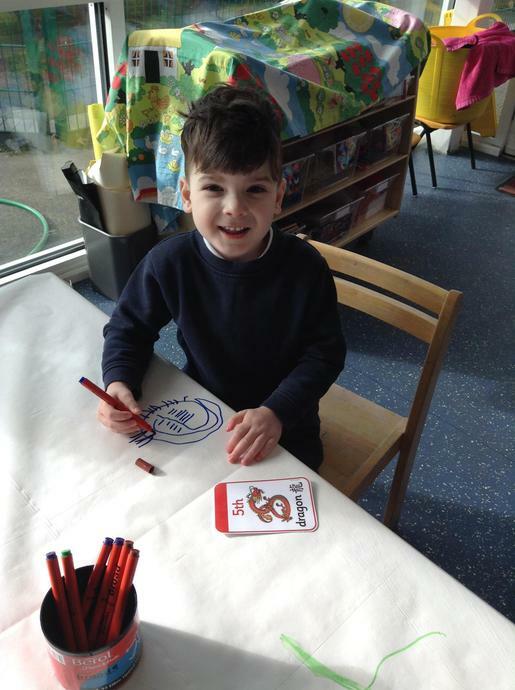 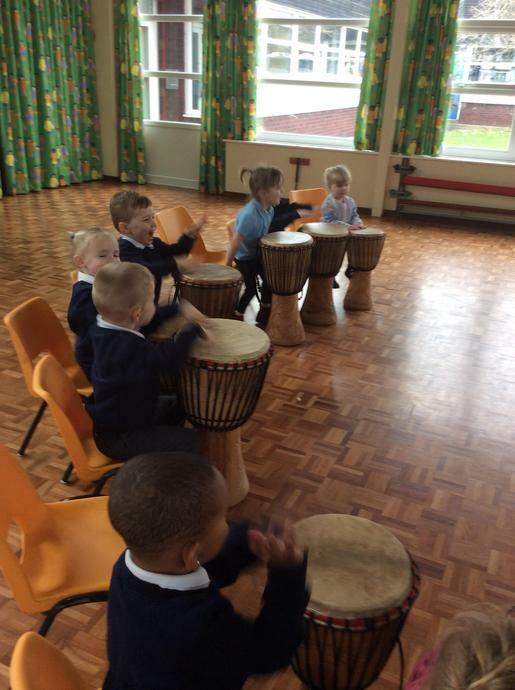 We always have lots of fun in Ladybirds. 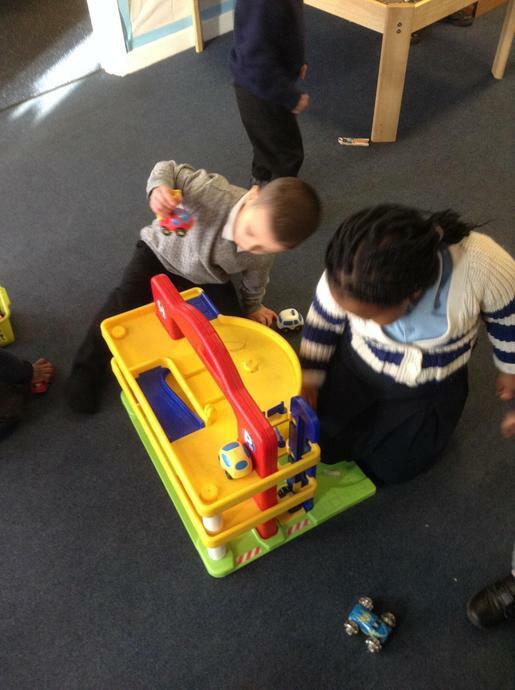 Here are a few photos of other things we have been up to. 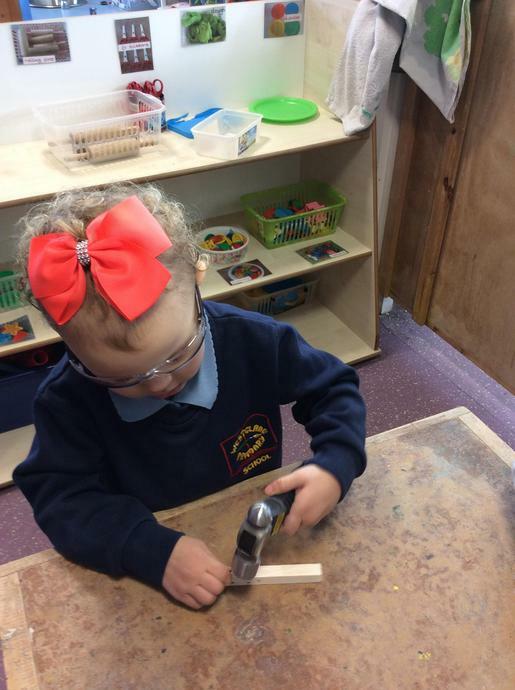 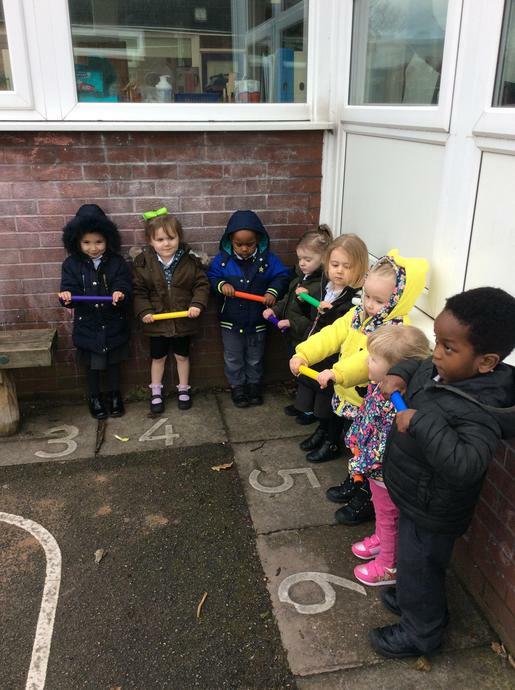 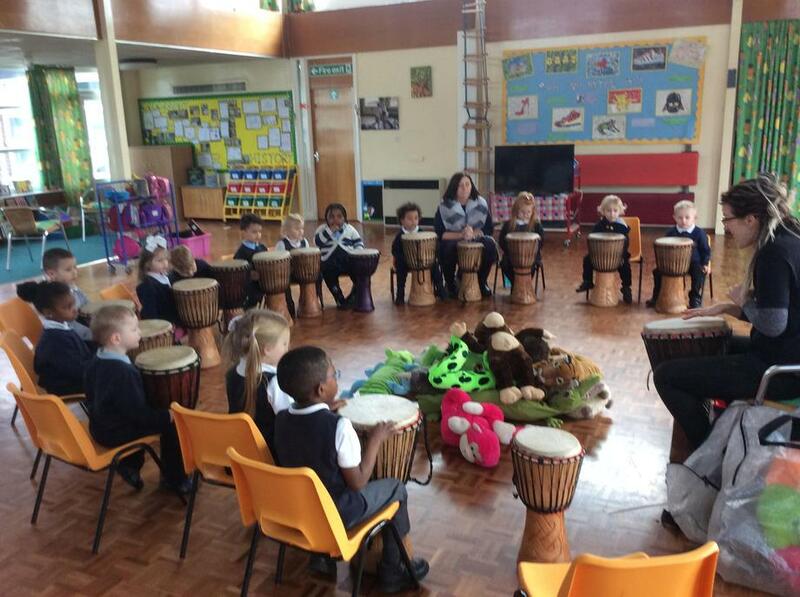 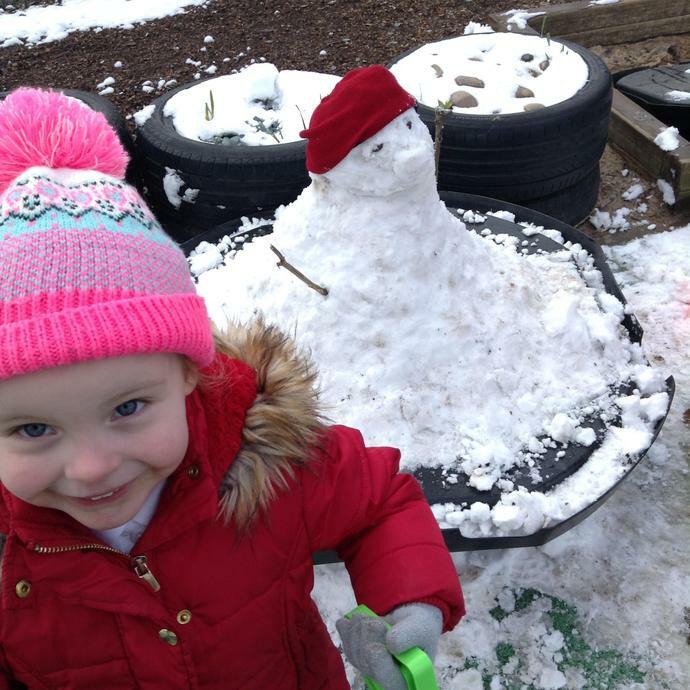 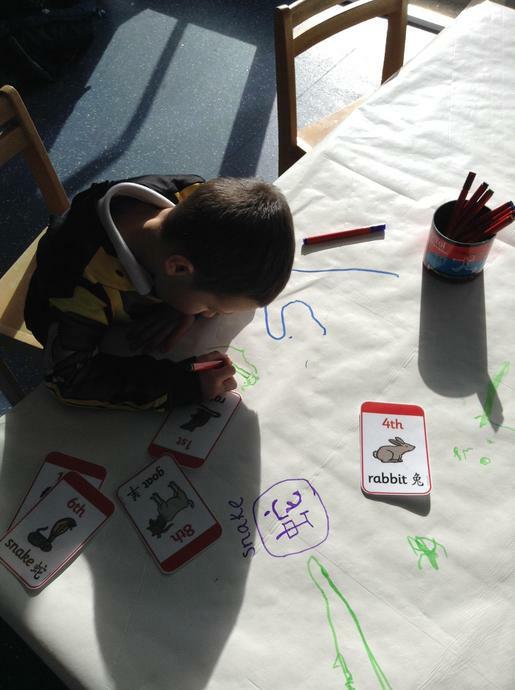 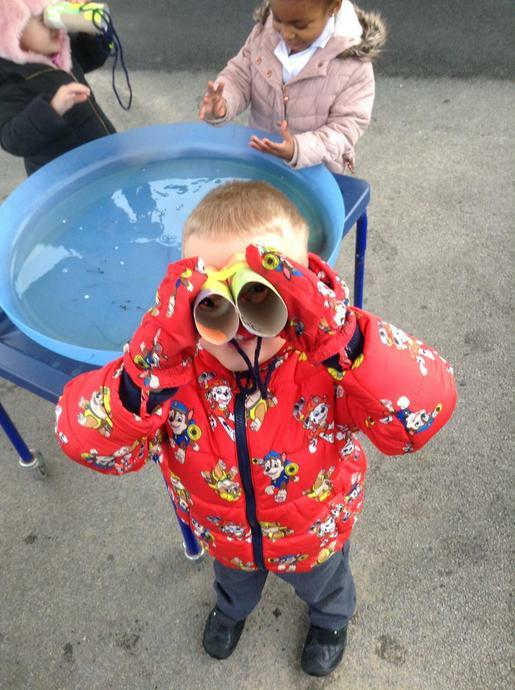 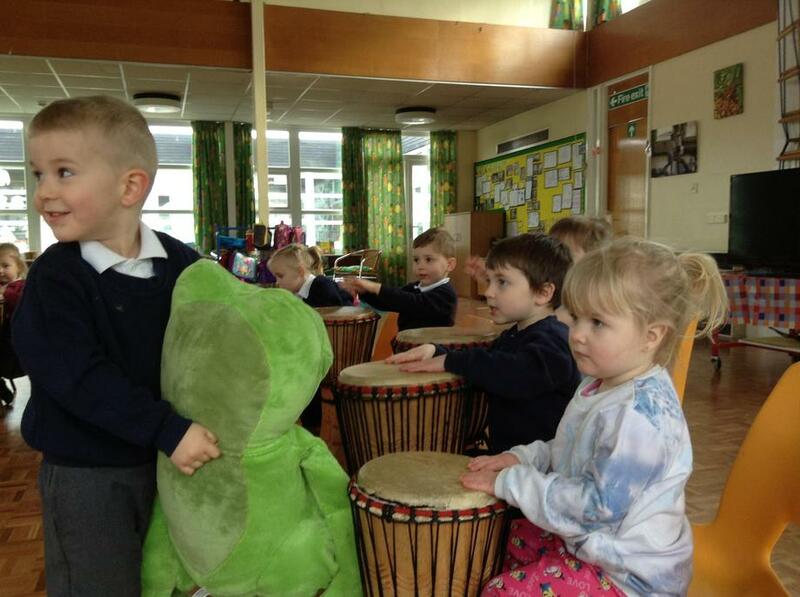 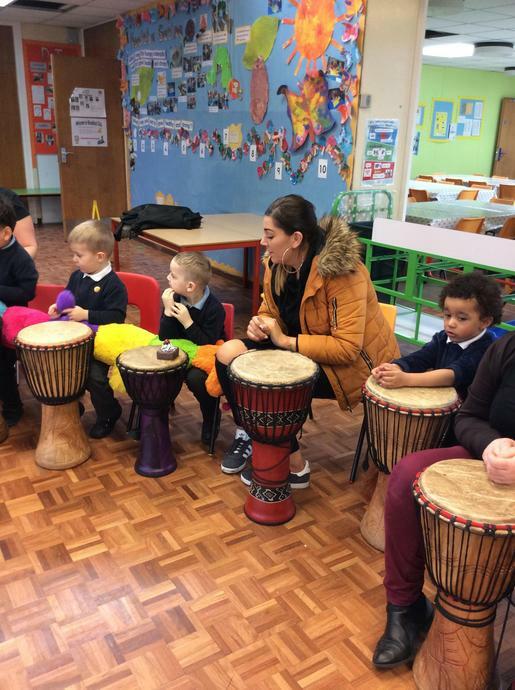 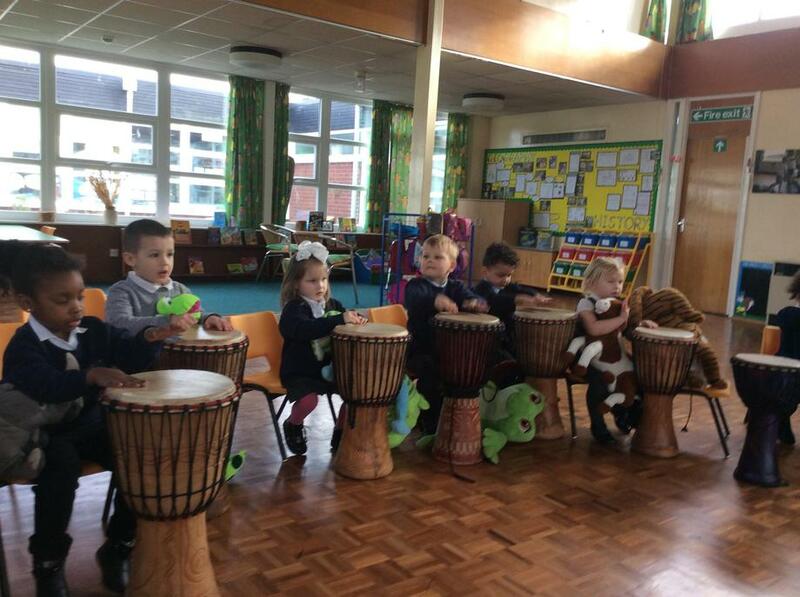 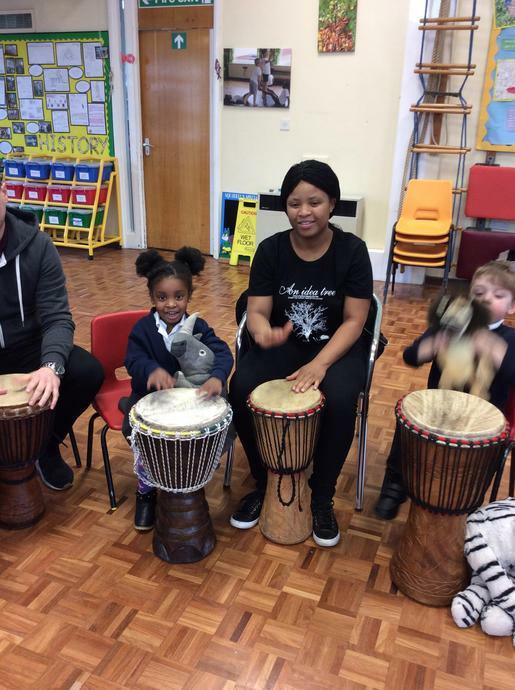 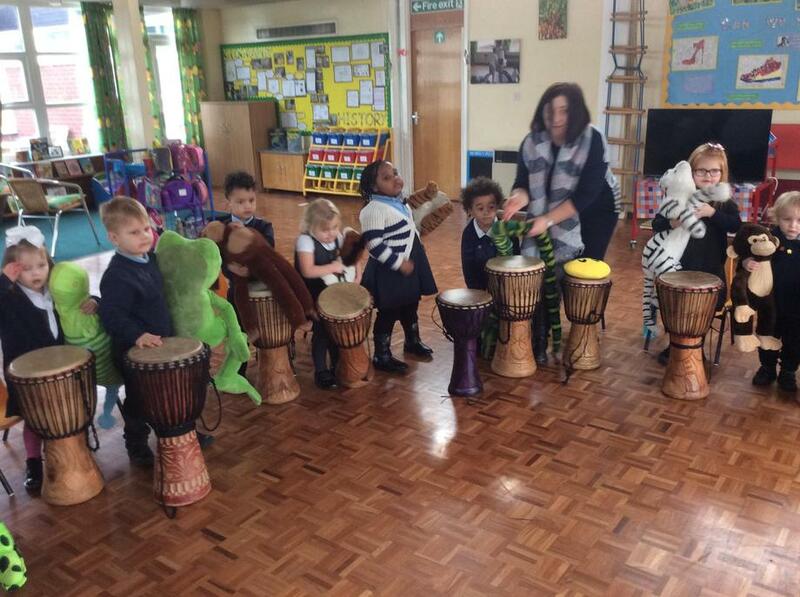 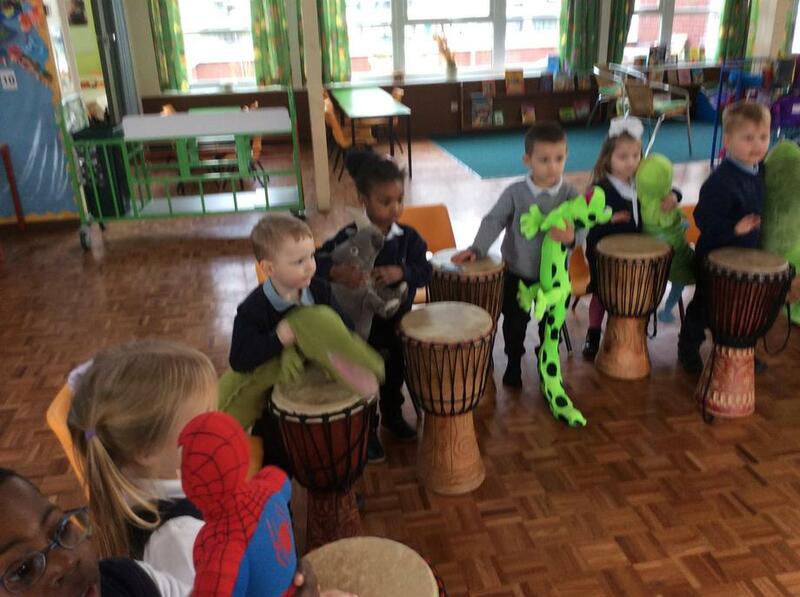 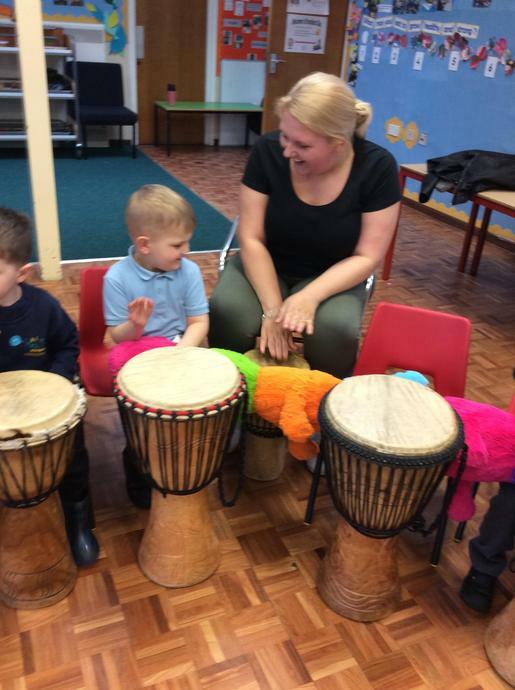 We have had a busy few weeks in ladybirds since the start of the Spring term...We have been learning new skills, having visitors (human and animal!) 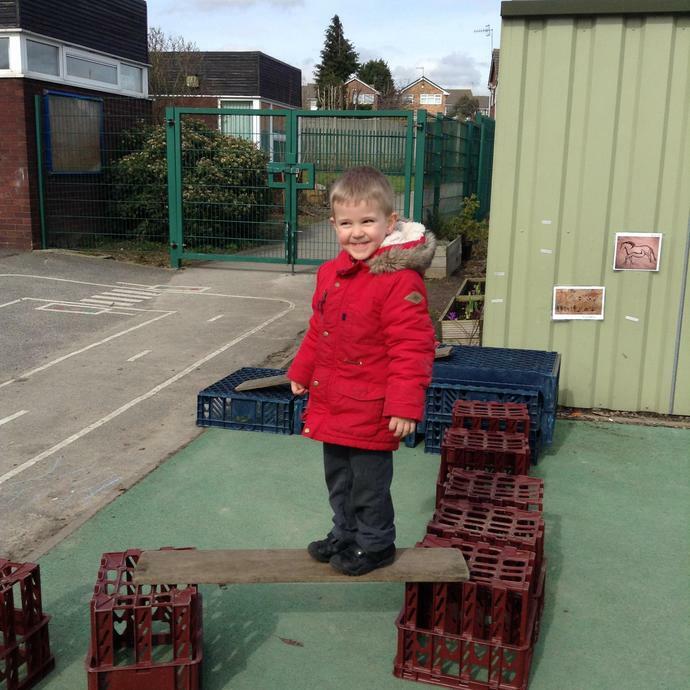 and generally having fun at school! 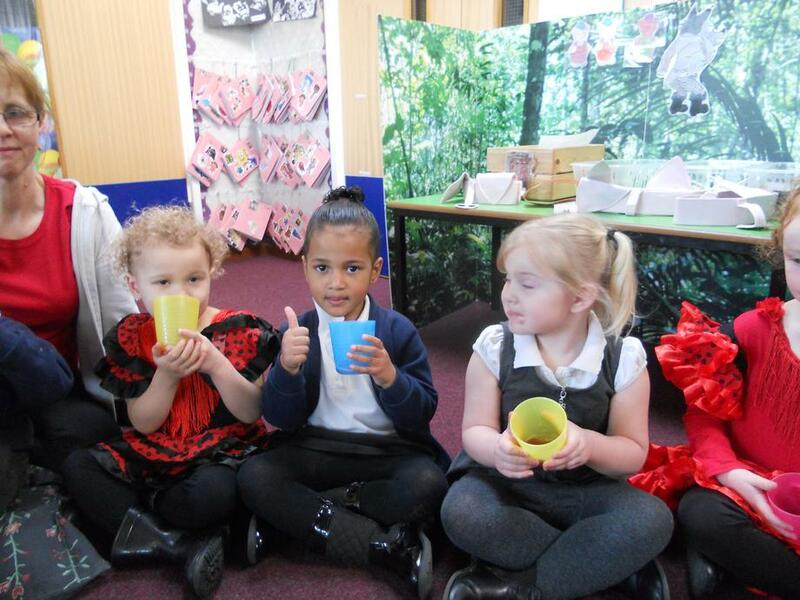 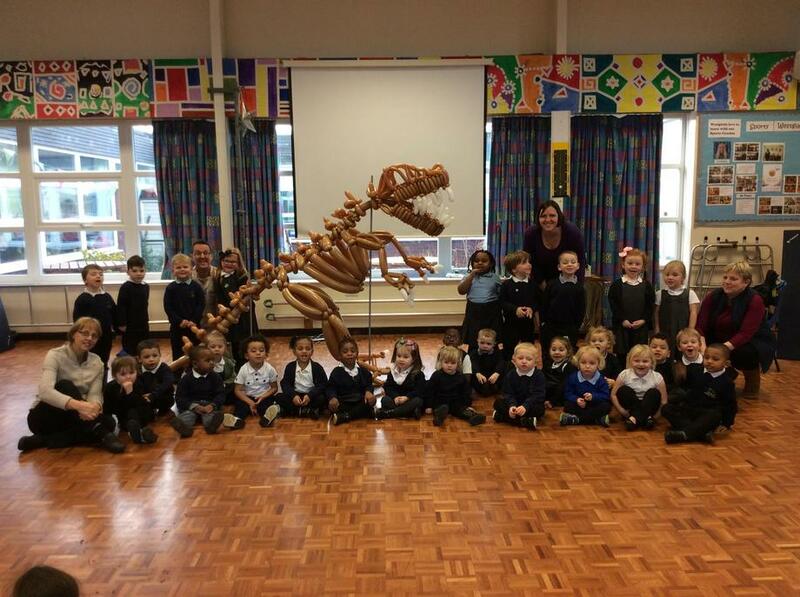 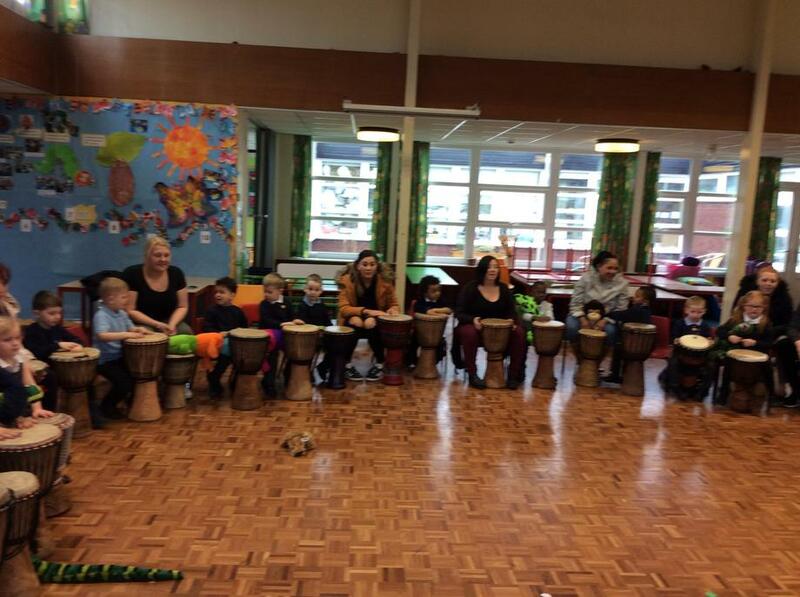 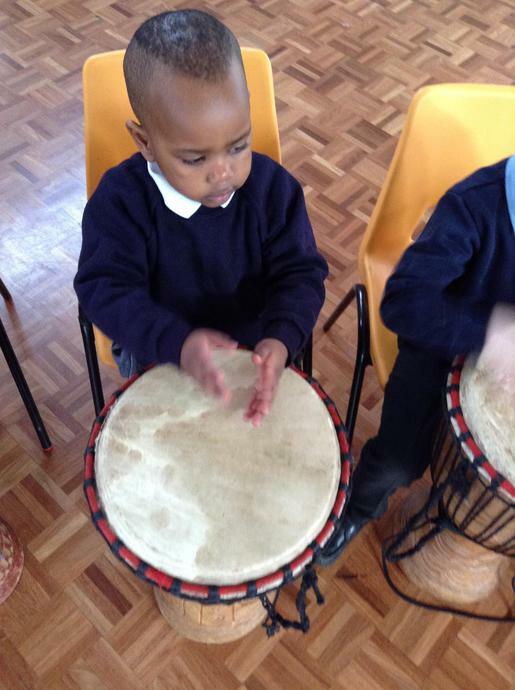 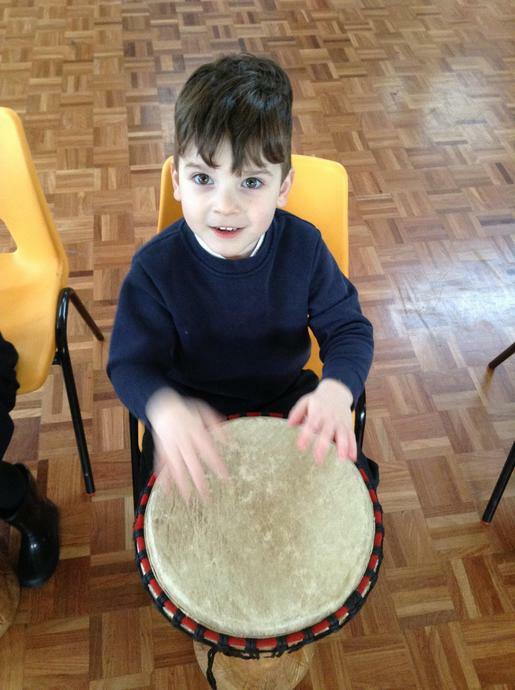 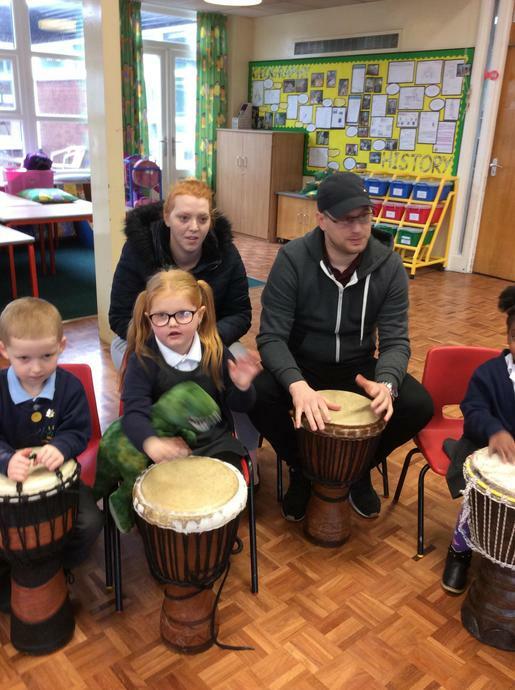 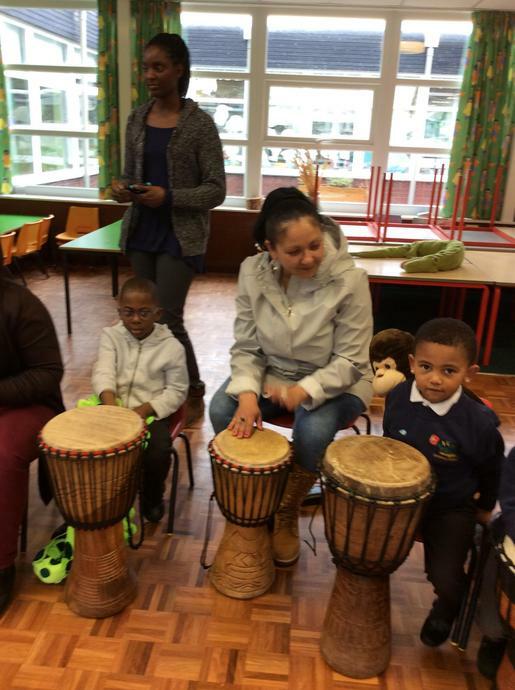 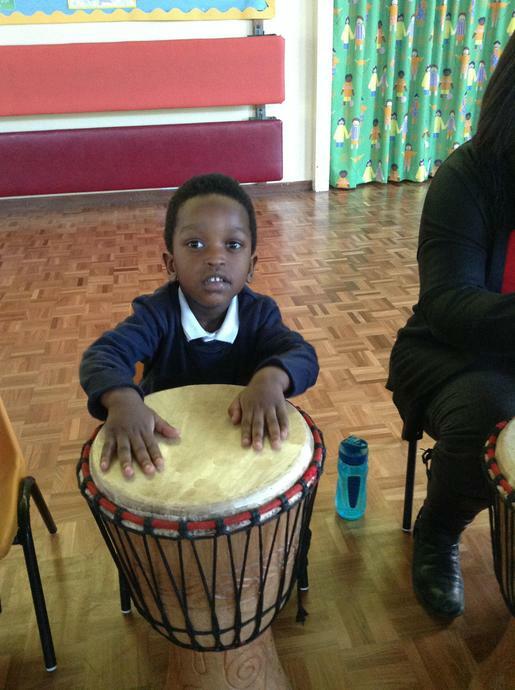 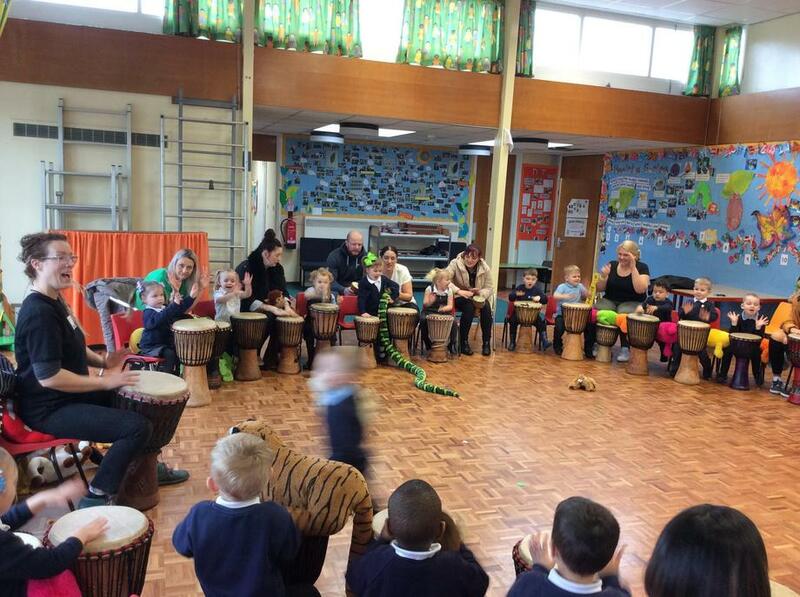 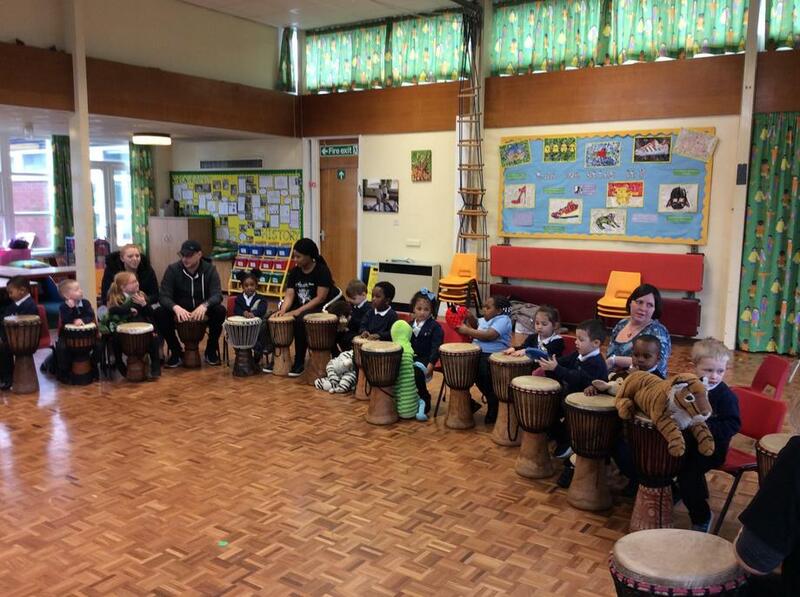 Have a look at the photos to see what we have been up to!